In 2007 I saw a Polaroid of a Giant Armadillo – a Tatu Canastra – pinned to a hotel wall near Canastra National Park. The animal has been on my top five most wanted list ever since. 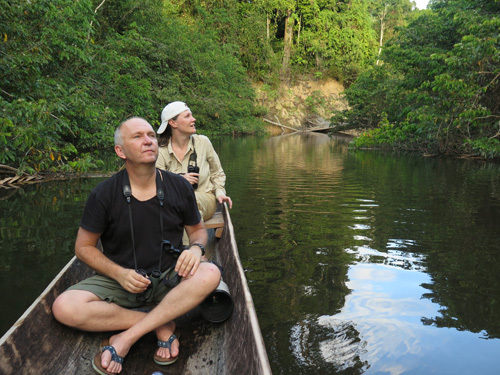 So in August 2013 I decided to visit a Giant Armadillo research project in the Pantanal where Phil Telfer had seen the animal, and combine that with a couple of weeks in the Atlantic rainforest, primarily looking for primates, including many of those seen by Steve Davis in 2010. Once again I used the brilliant Regina Ribeiro for many aspects of the trip. She helped plan an itinerary and booked accommodation, found local guides, and accompanied me for a few days too. It was a slightly more relaxed itinerary than I usually take – two nights in places where normally I’d stay one – so I was interested to see whether that would pay off. Maybe I’d finally see that Jaguarundi or Tayra for instance. Brazil has become an expensive place to travel. The sharp decline in the Real – by more than 10% against the dollar in June – helped a little. But food and a lot of the accommodation was more expensive than the USA . The Brazilian way of getting things done is equal parts of joy and frustration. There’s frustrating amount of inefficiency (try picking up a hire car for instance), petty bureaucracy and reluctance to take decisions, coupled with a lot of goodwill. So while many of their systems appear to be based on an inherent mistrust, I found there was a lot of goodwill among the people I dealt with. So frequently I’d be told flatly that such and such “is not possible without permission and the manager isn’t here”… only for the same people to start making phone calls to try to help. The Brazilian banking system has no joy whatsoever attached to it, and comes only with a shitload of frustration. When I arrived in Sao Paulo I used an airport ATM and after a couple of unsuccessful attempts managed to withdraw some money. Somehow my card details were copied during one of those transactions and a few days later someone was trying to withdraw thousands of dollars from my account. My bank stopped my card and I figured I could withdraw money using a credit card and passport, like I have done in so many places. Apparently this is not possible in Brazil. I could only withdraw money from an ATM using my credit card with a pin number: and that was a number I didn’t know (this seems ridiculous as a passport is surely more secure than a PIN). A Western Union cash transfer didn’t work either: after waiting in the chaotic Banco Da Brazil in Ilheus I eventually managed to get authorisation to collect the cash. Trouble was after being handed a wad of papers I was told to join the queue with at least 50 people in front of me, and only two cashiers working. I told them I’d collect the money elsewhere thinking that would be easy. It wasn’t: the Western Union order disappeared from the system and Western Union still claim the bank paid the money to me. So take several ATM cards and take cash: because if it can go wrong it will go wrong in Brazil. My overnight flight to Sao Paulo from JFK arrived three hours late after an emergency stop in Puerto Rico to evacuate a sick passenger. I’d planned that day to visit Nazareth Paulista, an hour’s drive from Guarulhos Airport, and a site for Buffy-tufted Marmoset and Black-fronted Titis. The car and driver Regina had arranged to take me were waiting. Unfortunately the monkeys weren’t waiting. And 2 p.m. is about the worst time to look for them. I spent an hour wandering up and down the road and – after getting permission – in the grounds of the IPE station. I went for lunch, thinking I could come back for the monkeys at four. Unfortunately there was some miscommunication and the driver had to head straight back to Sao Paulo after lunch. A pity, though I will return to Sao Paulo one day and hopefully see them then. 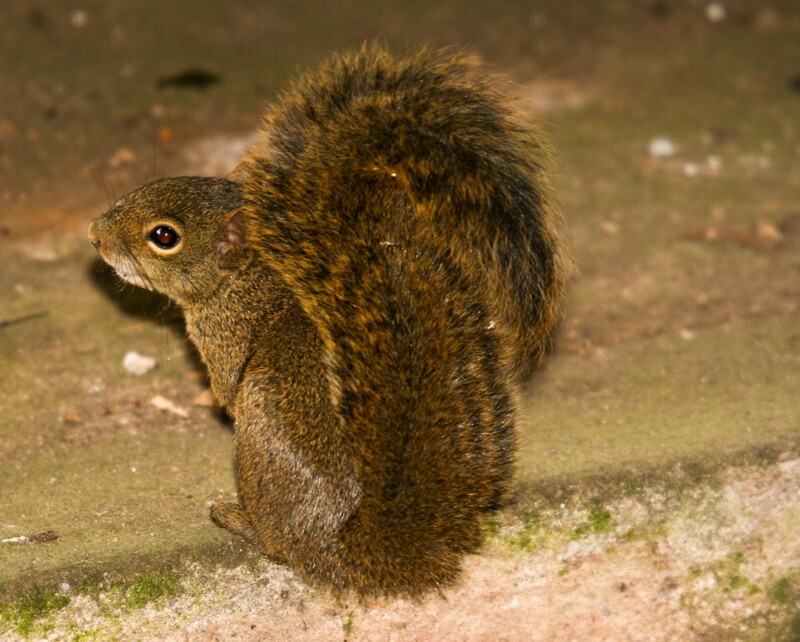 I did see a Guianan Squirrel in the gardens of the IPE centre. To get to the site from Guarulhos, take the highway Don Pedro I to Nazareth Paulista then on towards Jacarei. At km 47 there is a dirt road on the right side, with a sign to “ Bairro Moinho I ’’ . Take this road and after about 1km you find the IPE institute. Park the car here and look for the monkeys in the forest along the road near the institute (they often cross the road). Don’t take any side trails as it is private land. In 2007 internal air travel in Brazil was chaos. Things appeared to have improved judging by the easy flight to Ilheus via Belo Horizonte (and by every other internal flight I took for that matter). The guys taking me to Serra Bonita eventually met me and, after spending over an hour buying a local SIM card (taking out Brazilian citizenship might have been a simpler procedure), we set off on the 3.5-hour, 150 km, trip in an ancient Toyota Troopie. The last few kilometres are on a steep dirt track. And we broke down on the hill, 3km from the lodge and without cell phone reception. So we walked the rest in the dark. About 1 km from the lodge, at 18.15, I had a great view of a Paca on the road. My 25lbs of camera gear was more than enough for me to carry. I left the other two to deal with the 60lbs of mammal traps and field guides. Why they didn’t simply leave the stuff in teh truck and take the lodge vehicle back down to get it I have no idea. Welcome to Bahia. 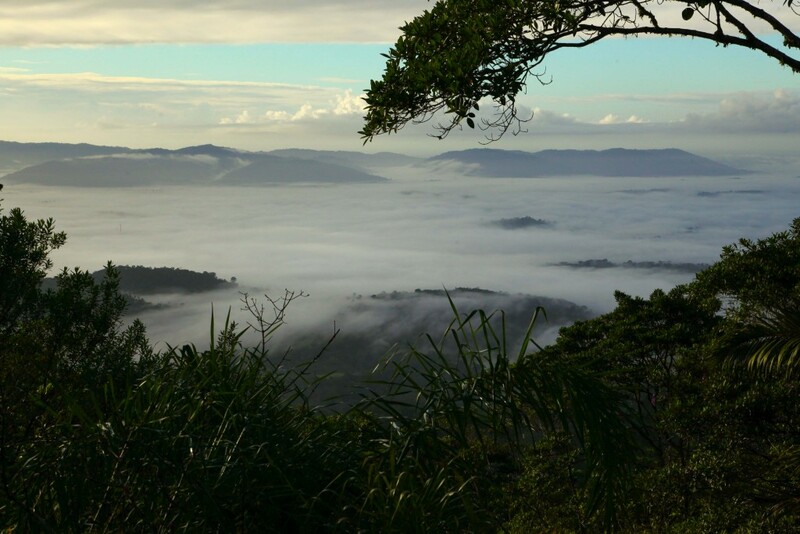 The Serra Bonita lodge is about 800 metres above sea level. 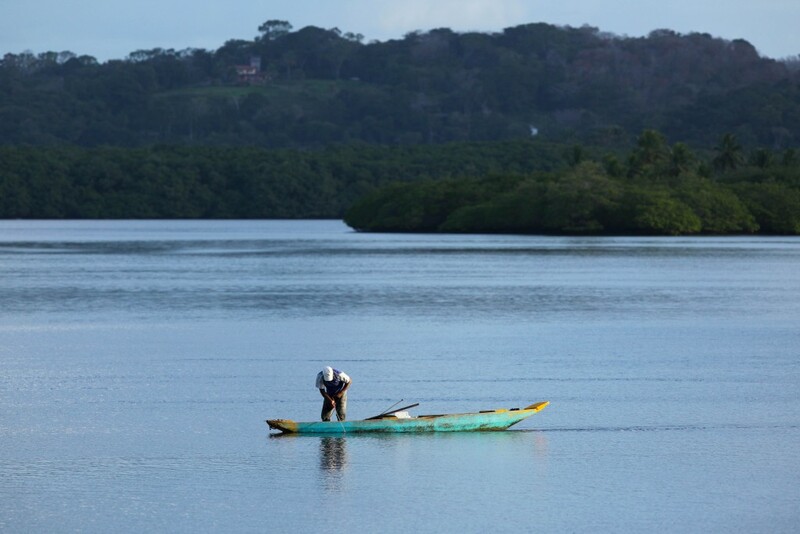 Known primarily as a bird reserve, it is a Private Natural Heritage Reserve, set up to try to protect one of the last tiny fragments of Atlantic rainforest left in Bahia. I was visiting mainly to see Weid’s Marmosets and the usually hard to find Yellow-breasted Capuchin that, presumably expelled from its troop, was travelling with them. 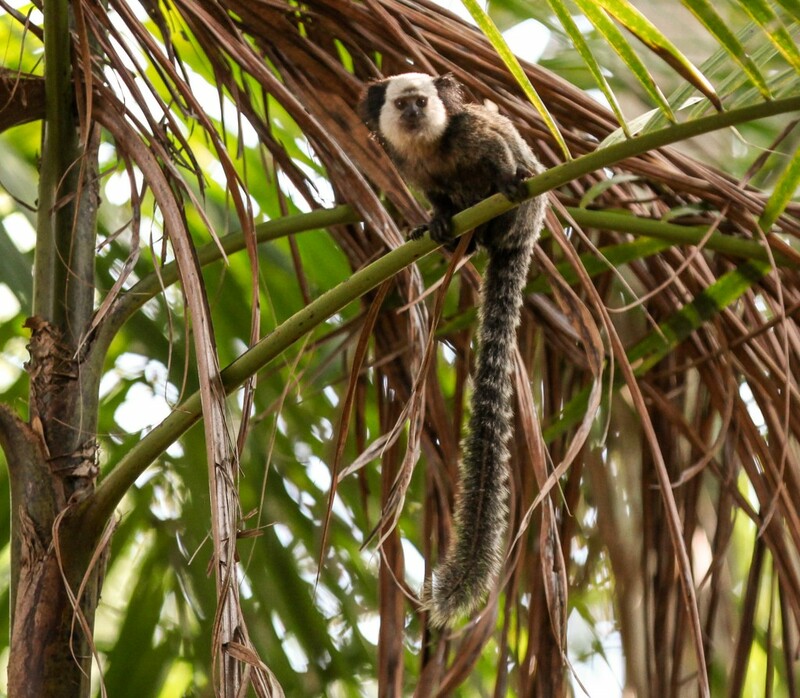 I was told the monkeys spent every morning around the main research station, feeding on bananas. Sure enough I saw them both mornings along the road between the accommodation block and the centre. 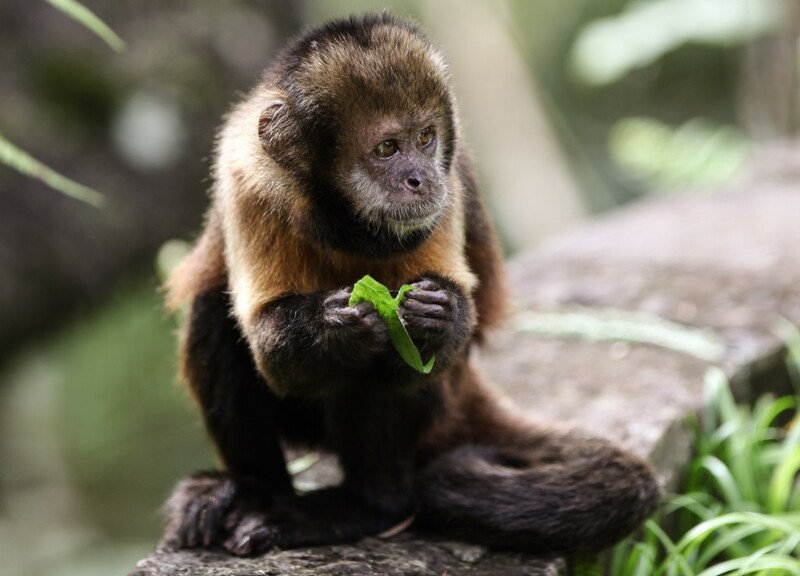 The marmosets were habituated but the capuchin was much shyer, preferring to play peek-a-boo from a safer distance. 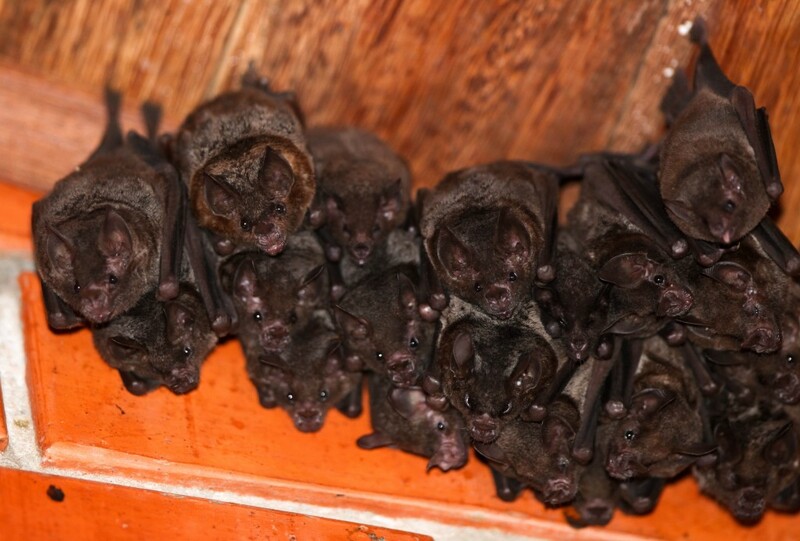 Under a porch on the station veranda at least two species of bats were roosting. 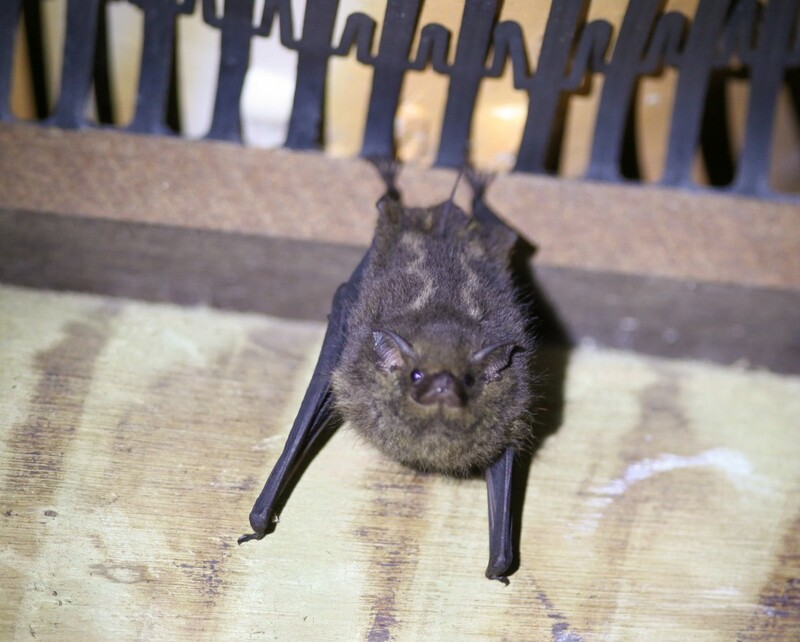 The first were a Short-tailed Bat species (Carollia brevicauda or perspicillata I believe, though its not possible to separate them based on photos) and Common Long-tongued Bats (Glossophaga soricina). A pair of Crab-eating Foxes visits the centre for food each night. I didn’t see them at their bowl but did see one during a spotlight walk along the road. Other than that I didn’t see any mammals . I spent almost three hours spotlighting, and saw only the fox. And I didn’t catch anything in my Sherman traps during 50 trap nights, baited with bread and banana, though small mammal trapping in the neotropical rainforest is difficult (or is when I try). The people running the station were lovely but it was a pity Vitor Becker, the guy in charge, was away, as he’s a well known naturalist and it would have been great to have had a chance to talk to him. Leo Patrial, a bird and nature guide, based in Itacare, north of Ilheus, met me at the bottom of the Serra Bonita road in the late morning. 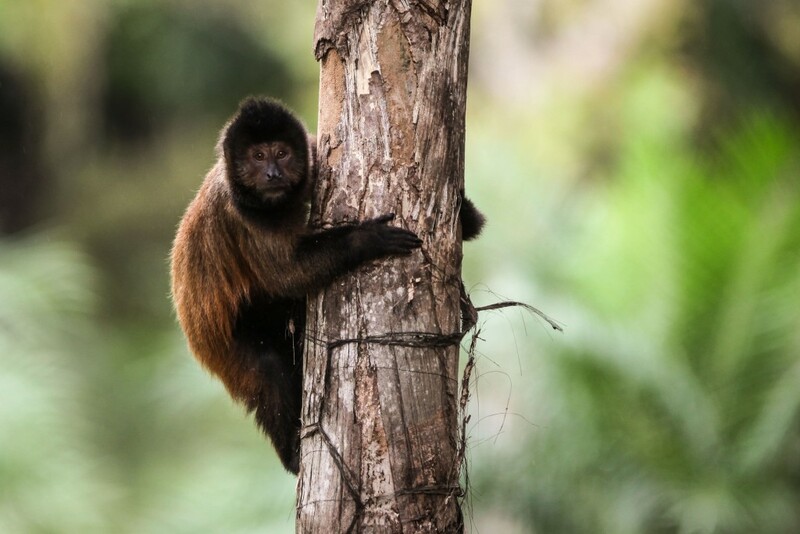 Una Ecoparque is where Steve Davis saw Golden-headed Lion Tamarins, and is also home to Coastal Black-handed Titi Monkeys (Callicebus melanochir). The Ecoparque itself has been shut for some time and Regina had tried to arrange access for me but the price became ridiculously expensive ($300 for a night drive was one of the more ridiculous suggestions). So she fixed me up with Leo, who knew the area, was knowledgeable on the mammals and also – it quickly became apparent – was a nice guy with boundless energy. We checked into the simple but super friendly, Indaia Eco Village, near the reserve and were driving through the forest at 4 p.m. Though the Ecoparque, and adjoining Reserva Biologic De Una, were sort of off limits, there is a network of roads running through good-looking forest that we could use. Leo was fearless with his 2wd Fiat. But if it rained, or you were more nervous than me, a Landcruiser might be preferable (albeit an expensive preference). On our first night we drove for three hours or so, first to the gates of the reserva, and then to the Ecoparque. But, despite perfect conditions – and quite open forest – we didn’t see a single mammal. There was evidence of armadillo (we thought Yellow Armadillo) diggings in many places, plus there had to be Opossums, Crab-eating Foxes and more. Perhaps we were just unlucky. The next morning we started at 6 a.m at the Puma Sign (which looked more like a house cat) on the main road, as this was reputed to be a good spot for titi monkeys. We heard some titis calling, quite close to the road, at about 7 a.m. but the forest is dense and there are few trails into it, so there didn’t seem much prospect of seeing them. 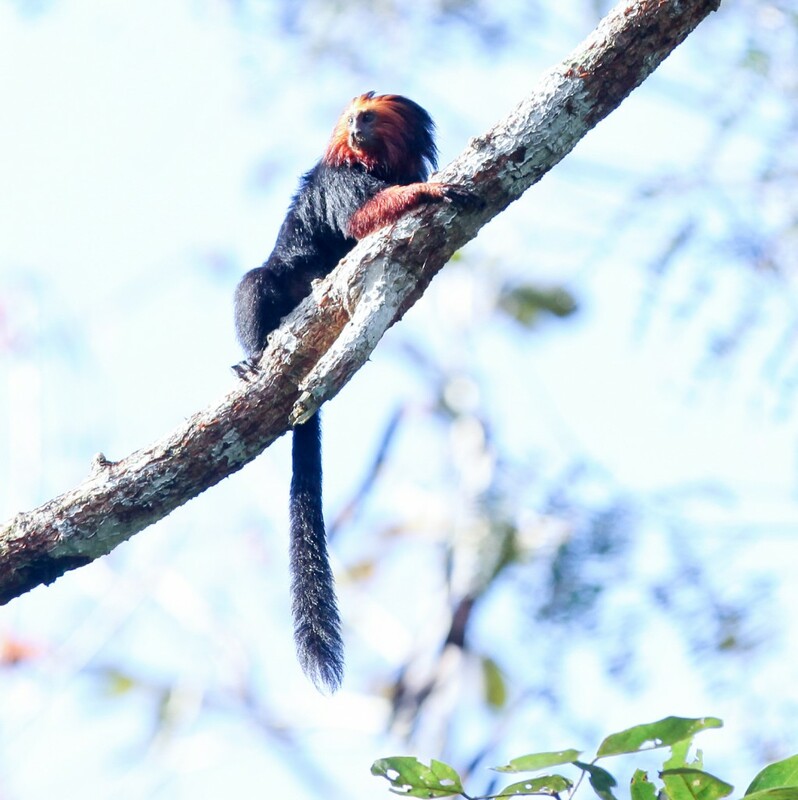 Instead we decided to look for the tamarins first and then focus on the titis. 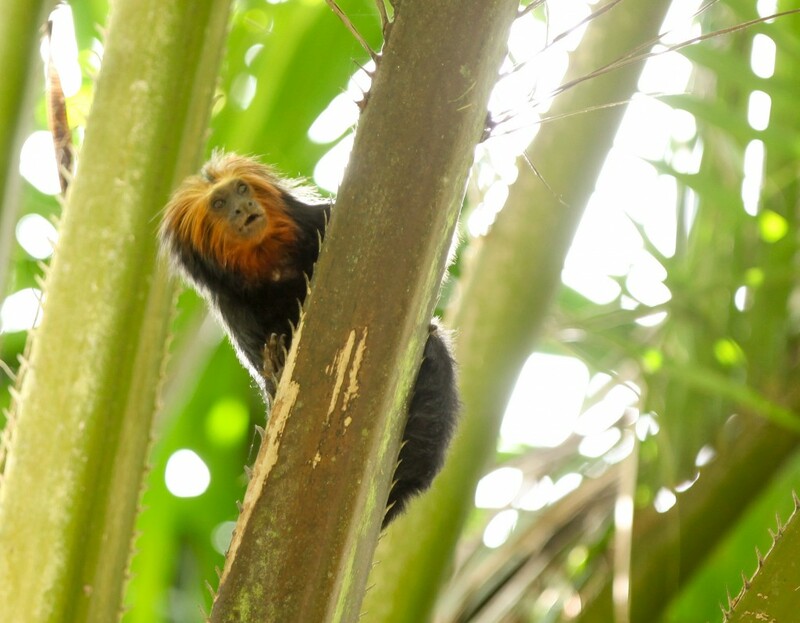 Leo had visited the area a week earlier on a recce and we found the Golden-head Lion Tamarins in exactly the same tree as he’d first spotted them in. We had great views of – presumably the same – family group three times that morning. Beautiful animals. To get to the tamarin place turn, head south from the “Puma” sign along the main coastal road and turn right after a kilometre or so onto a dirt road (this is a very rough guess at the distance). The road forks after a few hundred metres. The right fork heads to Una Ecoparque. The left fork goes to the reserve. Take the left fork and after another few hundred metres there’s a rickety Pantanal style bridge. A few hundred metres further on over the bridge the road passes through a really nice patch of open forest with some scattered palms. The tamarins were here but they are apparently fairly common along this road and the road to the Ecoparque. Back near the “Puma” sign we bumped into a local biologist who confirmed we were at a good spot for titis but he thought our chances of seeing them were limited without playback recordings. After an excellent lunch, siesta and swim at the hotel we headed back into the park at 4 p.m. 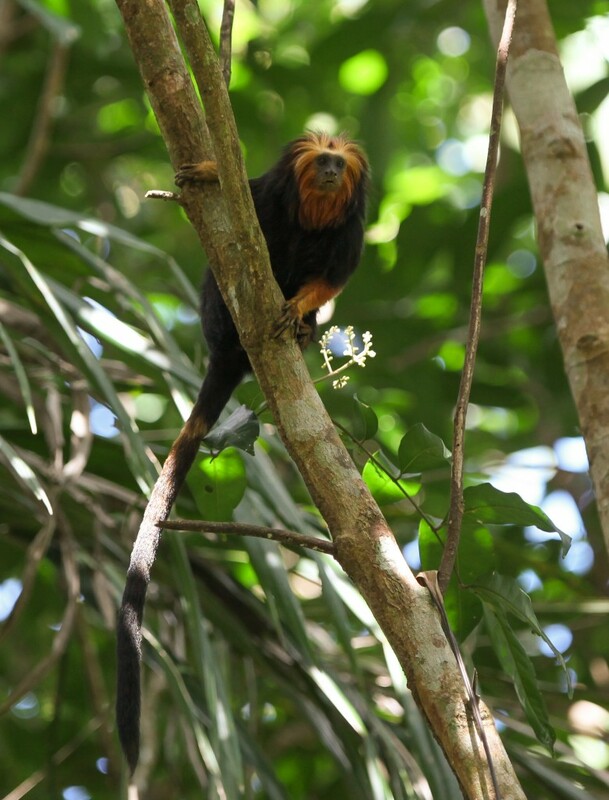 The tamarins were where we’d left them and once the sun set we walked and drove for 2.5 hours. The only mammal was a glimpse of a rat crossing the road. The next morning I wanted to focus on the titis but it was raining pretty hard. After the rain stopped Leo and I were patrolling the road near the Puma sign at 9 a.m. and I spotted some movement almost directly opposite the sign. A group of Weid’s Marmosets were at the road side. I was double checking each animal when I saw a Coastal Black-handed Titi Monkey’s face staring back at me. It was a clear but very brief view: the kind of view you see and then wonder whether you dreamt it. I decided I didn’t dream it and claimed my lifer for the day. 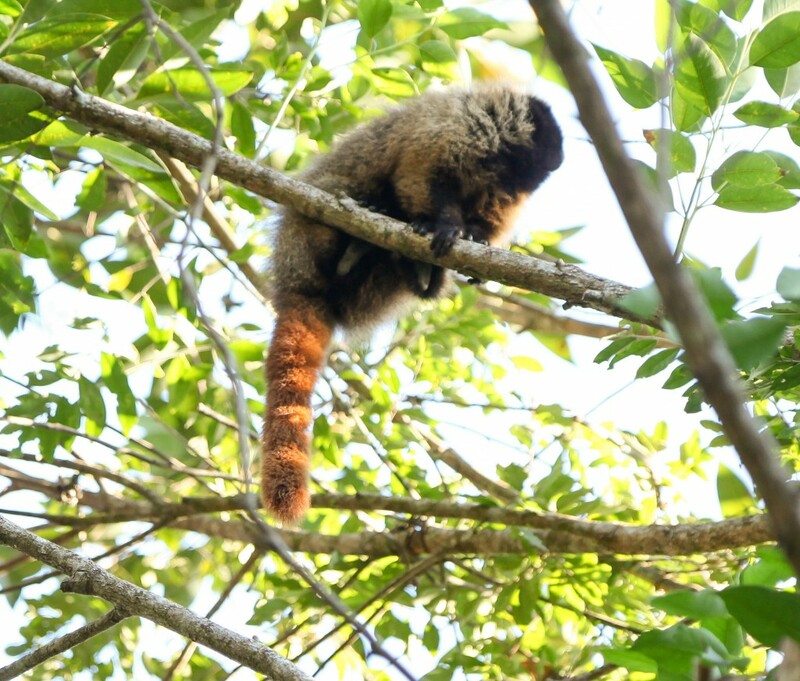 We couldn’t find the titis again, despite trying some call playback with Callicebus personatus calls I’d found on youtube so we returned to the hotel. 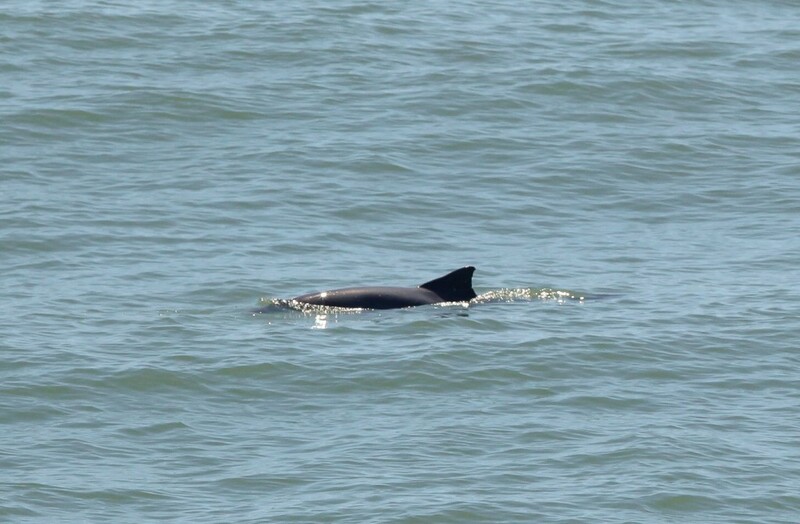 Leo had mentioned that the small sotalia dolphins – Guiana Dolphins or Costeros – were quite common in the area, and they were something I hadn’t considered looking for until I arrived in Bahia. They appear to be spotted from time to time all along the coast, and Google threw up quite a lot of research (such as this poster) about a resident population at the Port of Malhado, in the middle of Ilheus, which are easily observed from the end of pier. Easy to observe once you had reached the end of the pier, perhaps. But getting to the end was not so easy. The pier is not open to the public and you need permission to enter. The manager was the only person able to grant permission but he took some tracking down. The staff were all super nice and helpful, just not able to take such a monumental decision on their own. So Brazilian bureaucracy dictated Leo must write a formal email applying for permission for us to enter the next day. While Brazilian goodwill meant we used the computer in the pier office to write it, and the staff pretty much dictated what we should say. But still they weren’t able to approve our entry. Maybe tomorrow…. We spent the afternoon scouting other dolphin watching spots. At the jetty north of the pier we had a clear view of the lighthouse at the end of pier – the dolphin vantage point – but couldn’t see any dolphins. The fishermen hanging around the jetty said they often saw them there, but a few recommended we look under the bridge at the river mouth on the other side of town. So we ended our day there, having a beer, watching the water and chatting to the local fishoes. They claimed the dolphins visited all the time and one of them – Captain Coco – invited us for a free ride on his decrepit fishing boat to look for them. Only it wasn’t his boat it turned out later. Still we went out for an hour’s sunset cruise. No sign of the dolphins but we arranged with Coco a longer cruise, for which we’d pay the next morning. A two hour drive around the forest that night was disappointing though we did see another mouse and a Crab-eating Fox on the road to the Eco Parque. We set sail with Captain Coco at 6 a.m. the next day. He’d got a deck hand with him who had a wonderful Brazilian style ipod: a radio, inside a plastic bag, tied to the back of his baseball cap. Our two hour – $40 – trip up and down the river was good for birds and jumping fish but not dolphins. So Leo returned to the pier at 9 a.m. but no one knew if the manager has read our email. We were back at 10 a.m. Still no news so I suggested one of the inspectors might call the manager’s cell phone. He did and our request was approved immediately. Twenty minutes later we had driven to the end of the pier and were walking the last 50 metres to the small light house with waves were breaking over the causeway on either side of us. 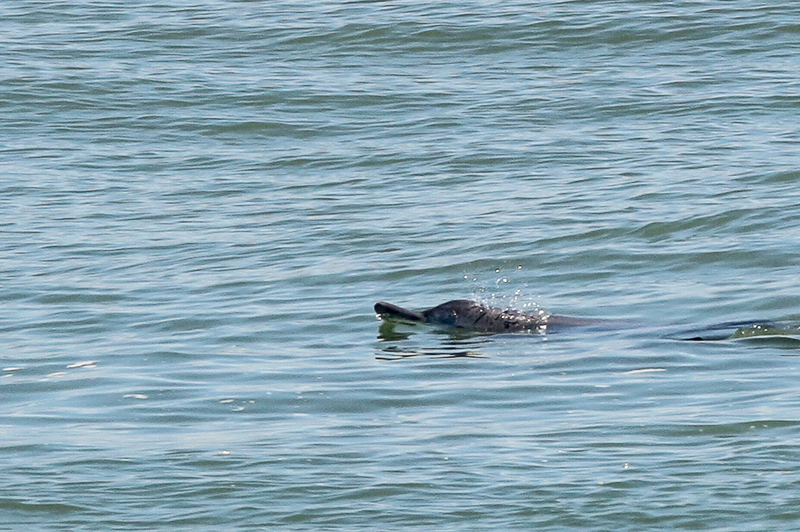 As soon as we set foot in front of the lighthouse I saw the fins of several Guianan Dolphins milling around some hundred metres off the end of the pier. It was as if they were moored to the end of the pier. We watched them for 30 minutes. My dolphin bubble was quickly popped after a visit to Banco Da Brazil. I tried to collect a Western Union money wire only to realise it was going to take two hours queuing with about 100 other people between me and the two cashiers to actually get the cash. So I told the bank we’d collect the money elsewhere only to find out that they money had disappeared when I tried again at a travel agency. Presumably a stuff-up by the bank, rather than blatant dishonesty but it was never rectified. 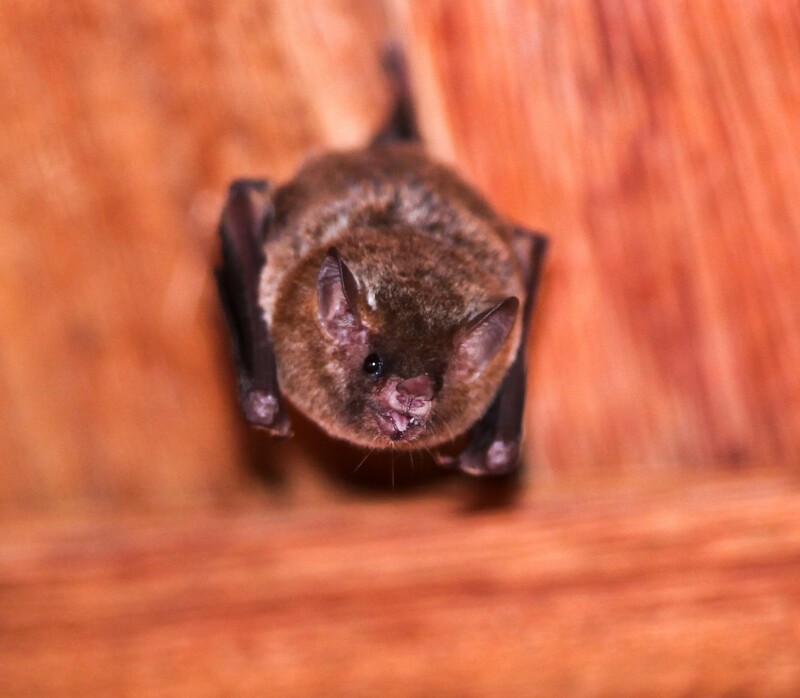 It hadn’t rained for a couple of days so Leo thought he could get the car back to the Ecoparque, which I wanted to visit to look for the Greater Dog-like Bats that Steve Davis has seen roosting under the roof in the visitor centre. The bats weren’t there though there were a few Greater Sac-winged Bats (Sarcopteryx blineata) roosting under the eaves of another building. 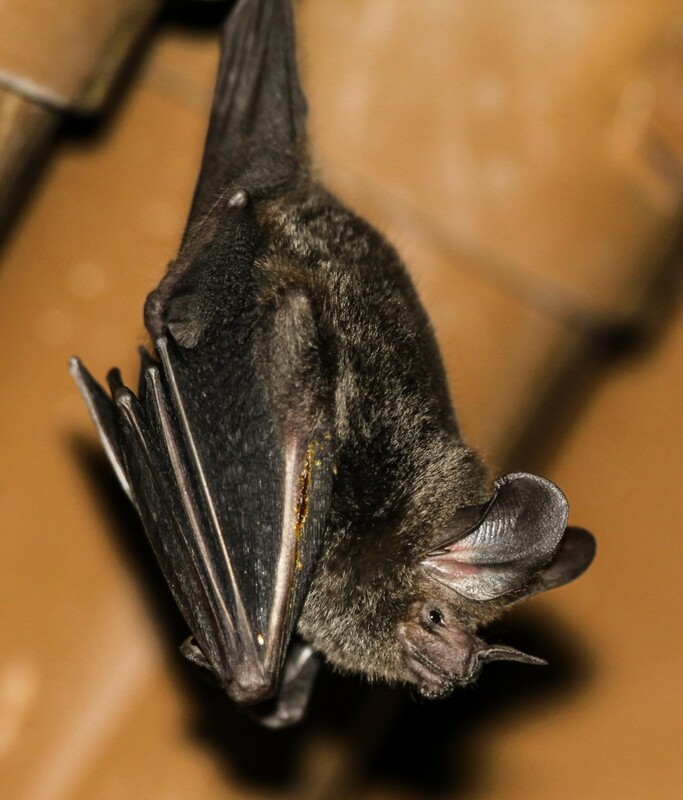 Although we didn’t have time to visit the canopy walkway (also good for roosting bats apparently) we did stop in at an abandoned house in the settlement next to the park where a Carollia species and more Pallas’s Long-tongued Bats were roosting. We left from there to carch my early evening flight from Ilheus to Vitoria. A good few days, despite the disappointing night drives. My thanks again to Leo for his company, guiding and willingness to take his car pretty much anywhere. I met Regina Ribeiro at Vitoria Airport, where I’d said goodbye to her six years earlier, and together with Vitorian guide Justiniano Magnago we drove the two hours to Linhares and the Vale Reserve. 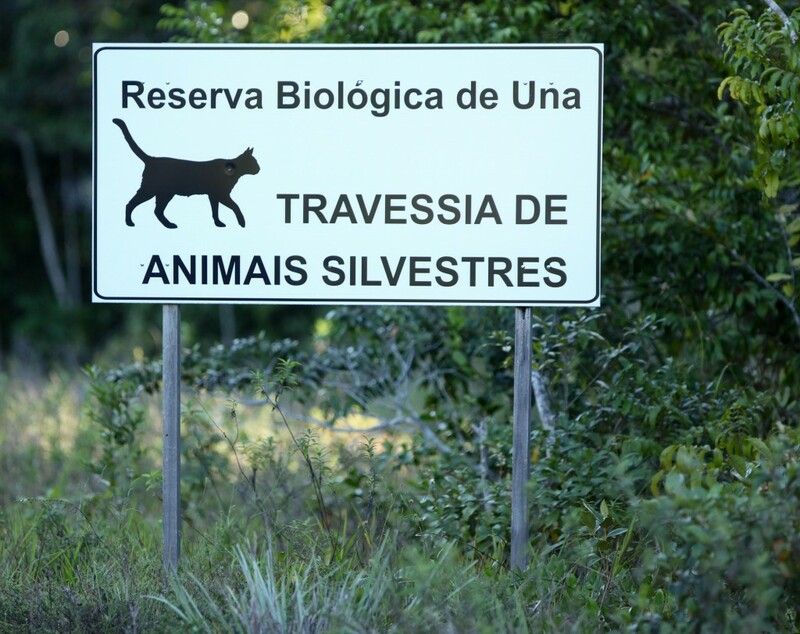 The reserve is a well protected block of Atlantic forest that is owned by Vale S.A, a mining company, who maintain it and a study centre there mainly as some sort of corporate social responsibility/tax break arrangement. Like many things operated by big mining companies there is very comfortable accomodation and lots of health and safety rules. The accommodation village seems to cater mainly for researchers and birders. The general public aren’t allowed to visit without an official guide. Justiniano, who visits the reserve often with his son Gustavo, is qualified as a guide. 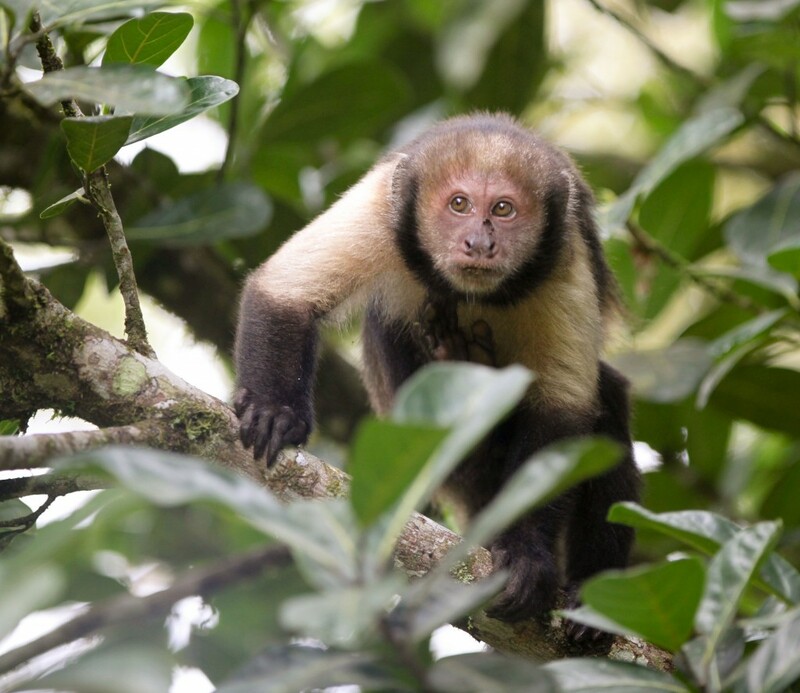 My main target here were the Robust Capuchins, an endangered species and a recent split from Cebus apella, with a fairly limited distribution in the Atlantic rainforest that runs north from Linhares. There were plenty in the fruiting Jack Fruit trees next to the restaurant at 6.30 a.m the next morning. Although the species can be hard to find there, we saw several groups in different areas of the park during a day and a half. 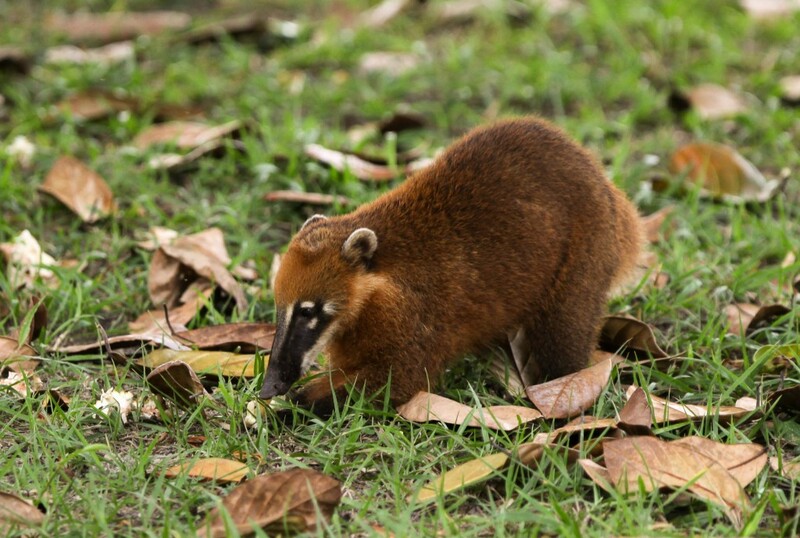 A group of Coatis were also running around, feeding on the fallen fruit. There is an excellent network of dirt roads throughout the reserve and we spent the rest of the morning driving them, mainly listening for Masked Titis (Callicebus personatus). The monkeys are apparently common, with a group often seen near the plant nursery (at the end of the road past the accomodation village) and another near the administration block. But we couldn’t hear any vocalising, perhaps because the weather was windy and relatively cold all day. 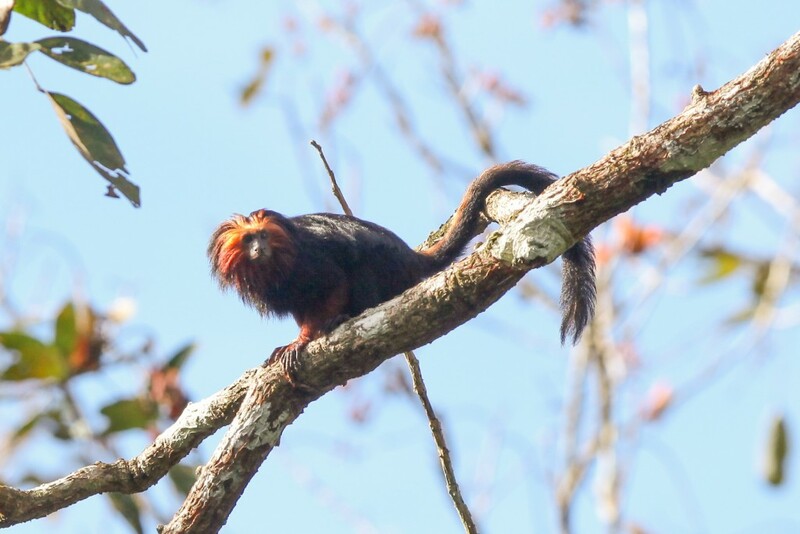 We did get brief looks at some Geoffroy’s Marmosets near the administration block, a species I had seen before at in Minais Gerais, though there the population are introduced. Meantime Justiniano saw a Grey Brocket cross the road while we were preoccupied with the monkeys. 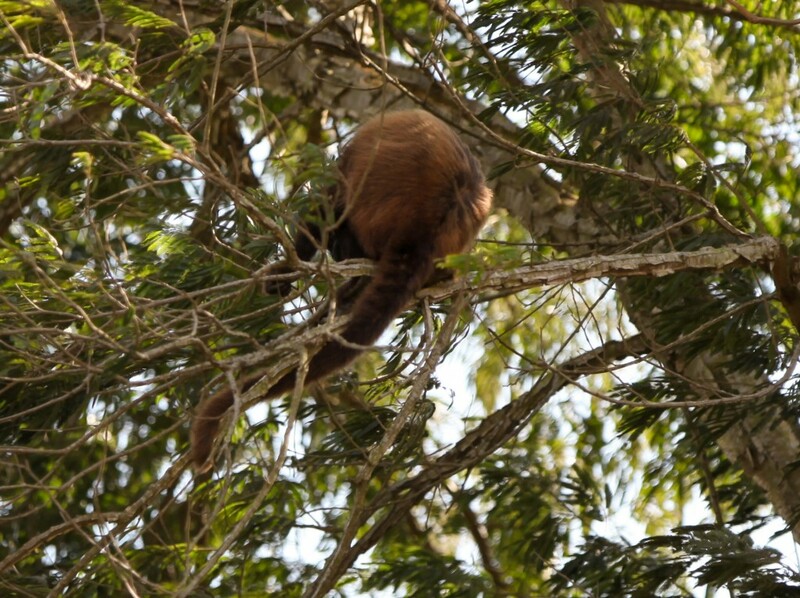 I also had an eye open for Tayra and Jaguarundi both of which are in the reserve and seen from time to time. 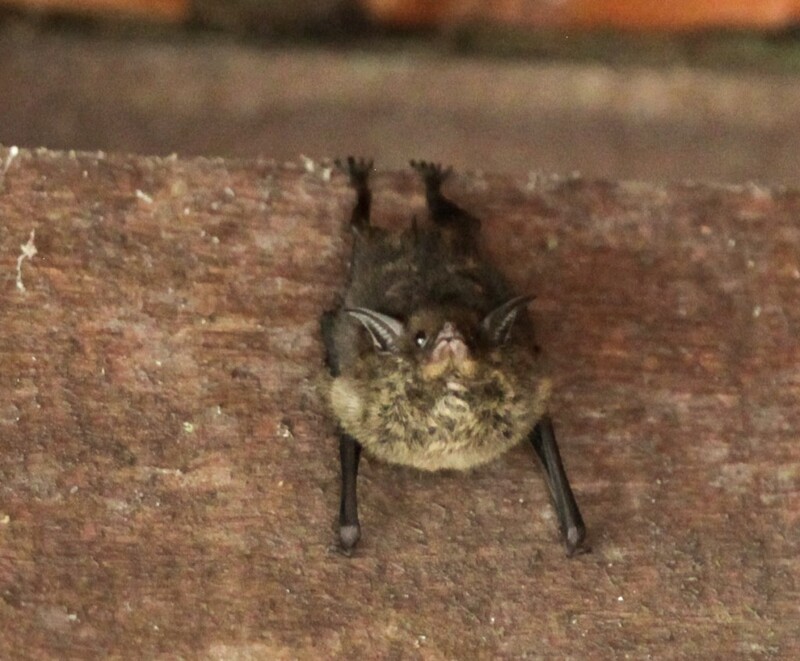 At the administration building we saw a couple of Lesser Sac-winged Bat (Saccopteryx leptura) – judging by their very faint back stripes – roosting under the eaves. 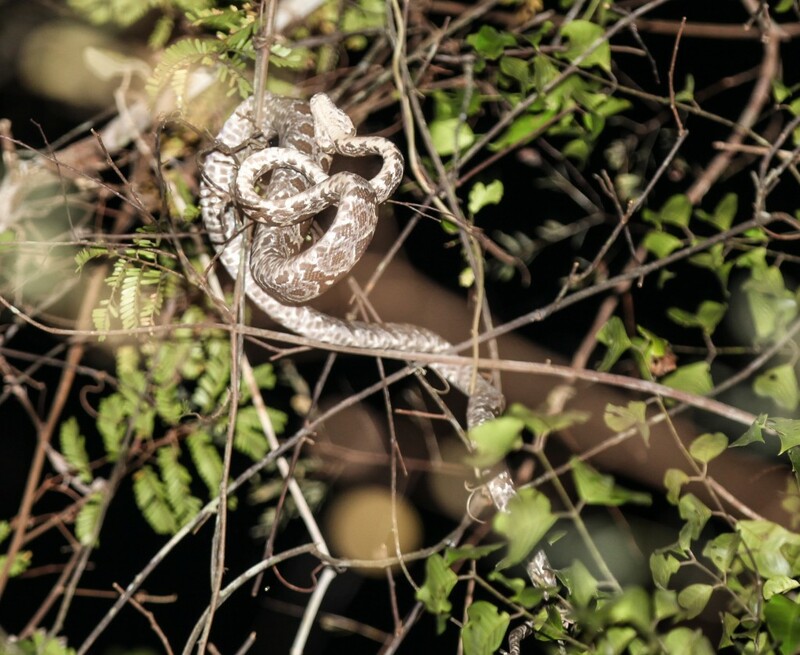 We spent the afternoon doing more of the same, while a 90 minute night drive through the forest was mammal-less, though we did see this nice Garden Tree Boa at the top of a tree. Driving back for dinner we found a Tapir visiting the pond along the driveway to the accommodation that gave nice views. 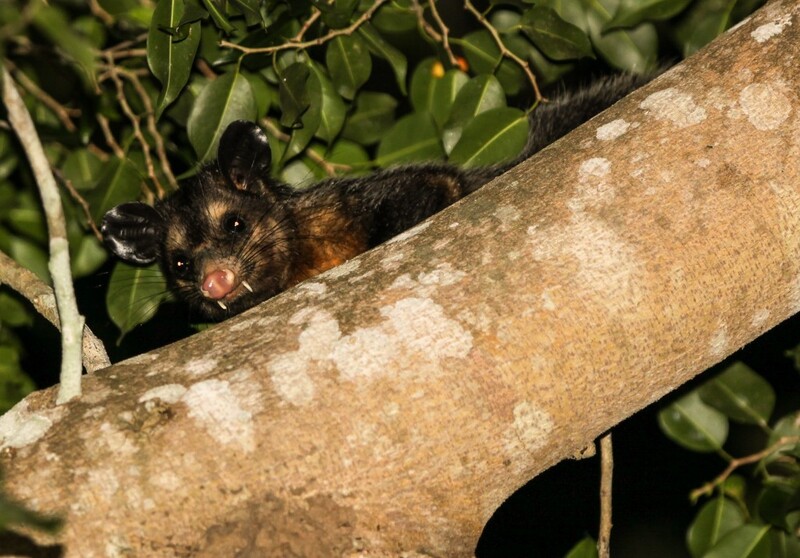 After dinner Regina and I wandered around the accommodation and she spotted a possum in a fruiting Dende palm. It was hiding for a while in the crown of the tree. 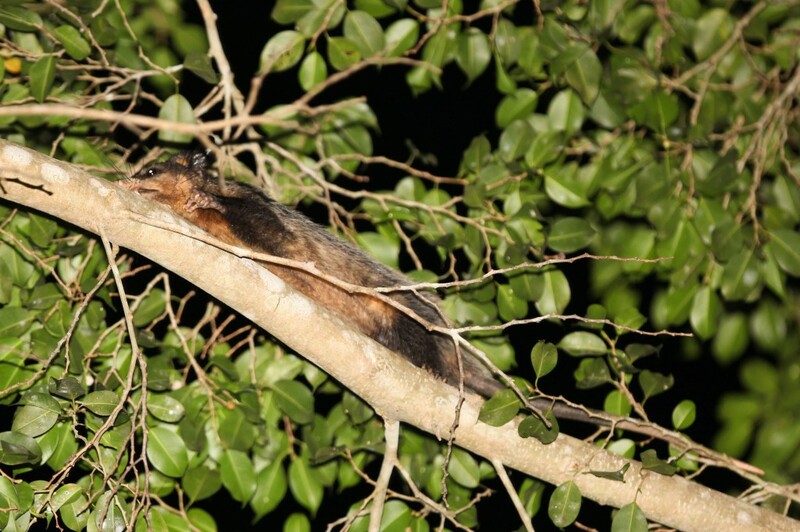 But when it moved onto the branch of another tree we got a good look at a strange animal. 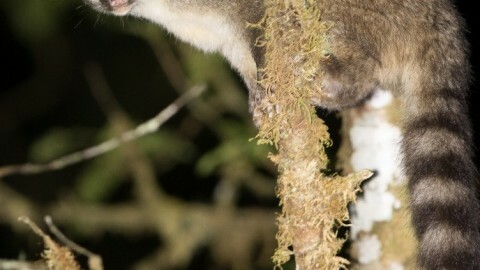 Its large black ears and tail mean, I suppose, it was most probably Didelphis aurita, the South-Eastern Common Opossum (aka Black-eared Opossum). But the fangs and striking colouration on the face were really quite different from all the pictures I have seen of that animal (the next night we saw many D. aurita at Santa Teresa, which all looked pretty different). The local experts shared the same opinion: a very odd and strange-toothed D. aurita. We spent four hours the next morning looking for the titis near the plant nursery (where there was no sign of them) and the administration block (where Justiniano heard them vocalising) but we couldn’t spot them. I did however get good looks at the Geoffroy’s Marmosets and at more capuchins. At 10.30 a.m. we decided to leave Linhares a day early and head to the small town of Santa Teresa, which was on the way back to Vitoria. 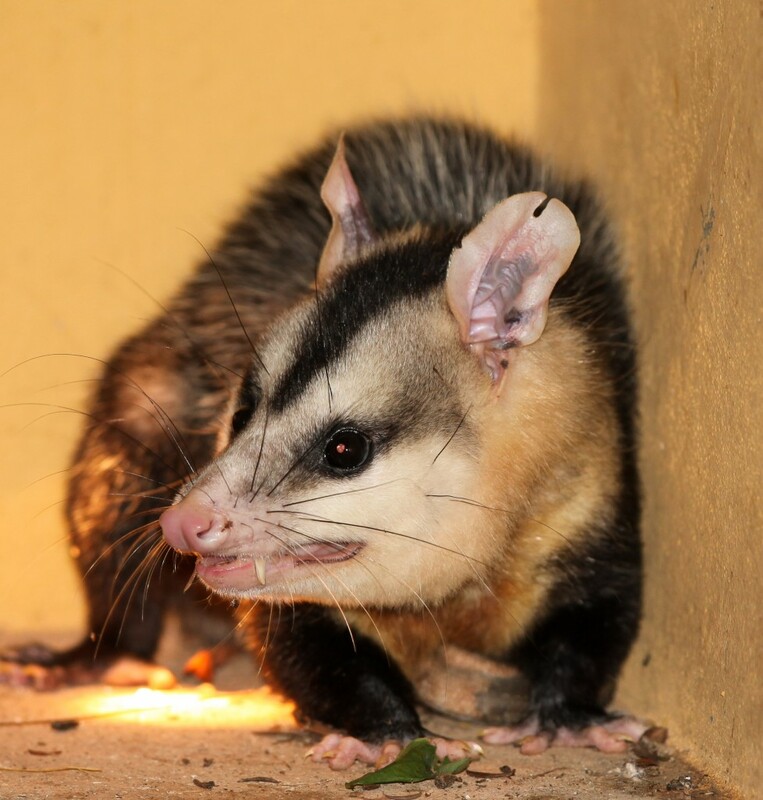 The little city park there is home to some wild titis (which Steve Davis saw), and also good for opossums at night. But first we stopped just outside Linares to look in a couple of large culverts under the road that a bat researcher had told Regina about. 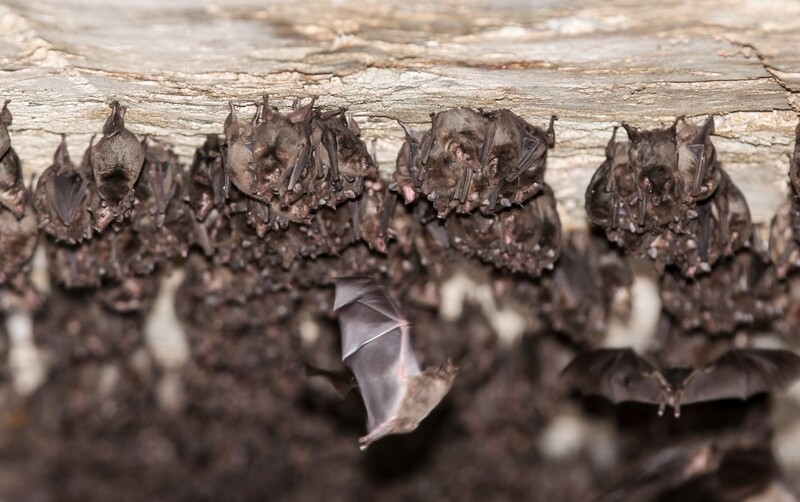 Access to the first was relatively easy – if muddy – and it was home to 20 or so of these striking and very cool Fringe Lipped Bats (Trachops cirrhosus). The other culvert was home to a bigger colony of a smaller species, roosting in a dense cluster. The culvert was flooded, stinky and muddy. But that wasn’t going to come between me and a possible lifer, so I took of my shoes and waded through the thigh deep water and thick mud to get some pictures of what were apparently were my first Geoffroy’s Hairy-legged Bats (Anoura geoffroyi). Well worth potential blood poisoning! Despite Justiniano’s formula one driving, the two hour trip from Linhares to Santa Teresa took longer because of traffic, the bats and lunch, and we arrived at the City Park a little after 3 p.m. an hour later than we’d planned. It was, as we feared, too late to see the Masked Titis (Regina felt titi watching is best between about 8 a.m. and 3 p.m.). Despite searching every bit of the small park we couldn’t find the titis but did see Geoffroy’s Marmosets easily. The park is open from 8 a.m. to 5 p.m. But with some advance planning it ought to be quite easy to get permission to visit outside of these hours. Unfortunately Regina’s contact at the park was in hospital and the manager was in Rio. And so we weren’t able to get permission to stay late to see the opossums which feed on the bird tables after dark. But at dusk we asked again: the guards at the gate thought it was quite bizarre that someone would actually want to make an effort to see an opossum but they made a few calls and got us permission to stay late. 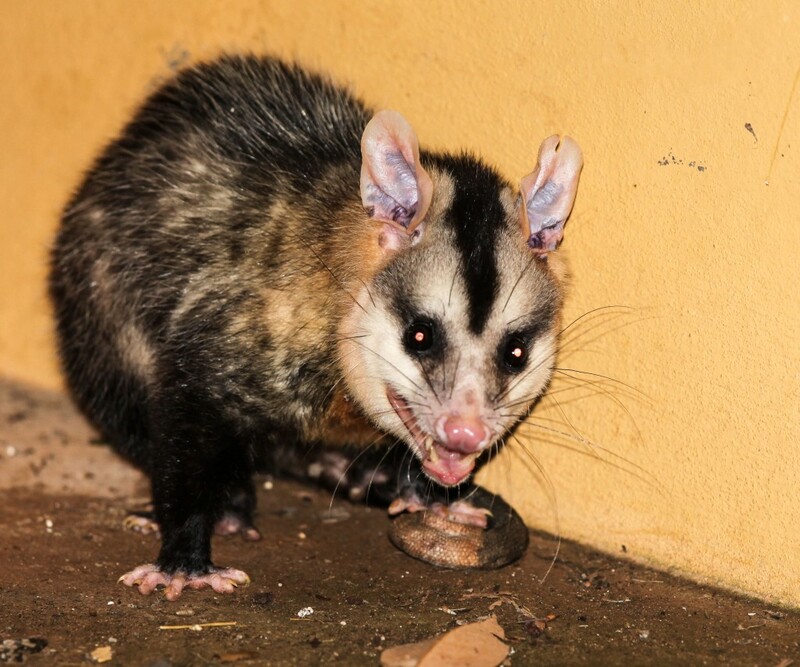 In an hour or so after dark we must have seen 10 to 15 South-eastern Common Opossums (Didelphis aurita) walking along the trails, all of them uglier and less colourful than the beast we’d seen at Linhares. We spent the night at a small bird watching pousada – Vita Verdi – that was lovely even if we didn’t see much of it. 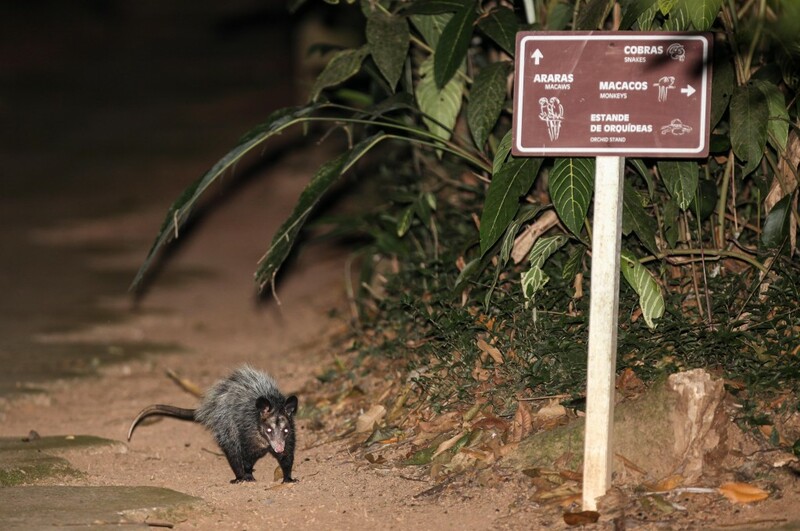 The owner sees opossums and porcupines (presumably the Bahia Hairy Dwarf Porcupine Sphiggurus insidiosus) frequently at night, when they come to feed on the bananas left out for the birds. He’d heard titis in the forest quite often too. We left the pousada at 6.30 a.m. for a last ditch hour in the city park to look for the titis before our flight from Vitoria. We had to renegotiate entry to the park but after some more phone calls we got it, and the security guards then joined us in our titi search. A guard spotted one – near the entrance – just after 7 a.m.. Oh the stress of it! I had 15 minutes – and good views of – two animals before we had to rush to the airport. Titis might not vocalise always until later in the morning but, at least on this sunny morning, they were moving around an hour after sunrise. Justiniano drove us back to Vitoria at warp speed and we made the flight. If you want to visit the Vale Reserve then I recommend him highly. He’s an impeccable guide and quite knowledgeable on the mammals of the forest too (and expert on the birds). He doesn’t speak much English but his son, Gustavo, does. They often work as a team and he can be emailed here. Regina and I flew to Sao Paolo, and after an hour’s wait to get a rental car from the strategically-shaved sloths behind the Avis desk we head along the snaking Dutra highway through Sao Paolo. The Dutra is 24 lanes wide, with each set of four lanes semi-independent of the rest. The sets of lanes frequently join and separate, like strands of spaghetti in a bowl, and it took a while to realise that I did not need to worry each time I found myself being swept off the highway in a filter lane: I was merely moving to a different section of the Dutra. 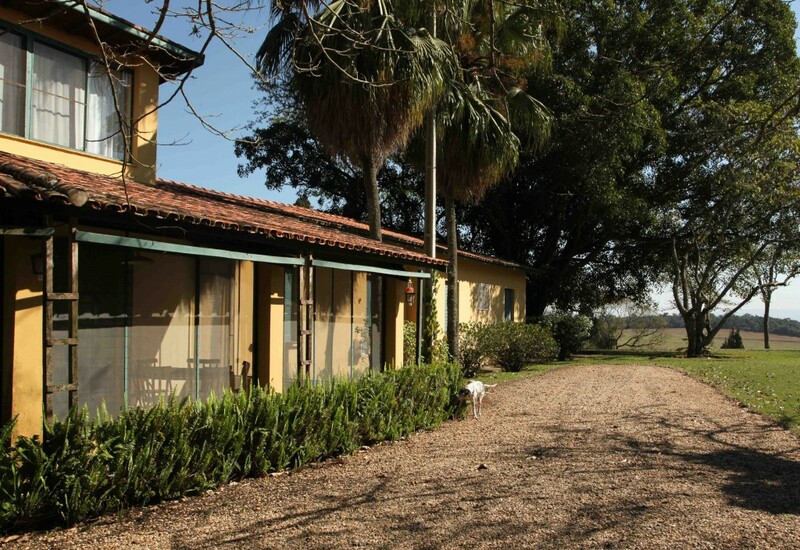 Four hours later we arrived at the really lovely Fazenda Bacury, not far from the town of Piracicaba. If it wasn’t for the big strip of Atlantic Rainforest in front of me I could have been on an outback Queensland cattle station. Leoncio de Magalhaes, the owner, greeted us. A fabulous guy whose grandfather bought the ranch in 1926 and decided to keep a 2000 ha forest block intact as a hunting reserve. Leoncio was a keen naturalist. I imagine that he runs the guest house largely out of pride in the forest and his desire to share it with others. He only takes one group at a time so we had the run of the lovely accommodation and the services of the cook who prepared the best food I’d eaten in Brazil, and some of the best cakes I’ve eaten anywhere. Bacury is not a place to stay if you are dieting. I was visiting mainly to see the Southern Muriquis that Regina had heard were quite easy to see here. A seven km track runs through a part of the forest. There are a couple of walking trails off of this plus two blinds set up in front of feeding stations. 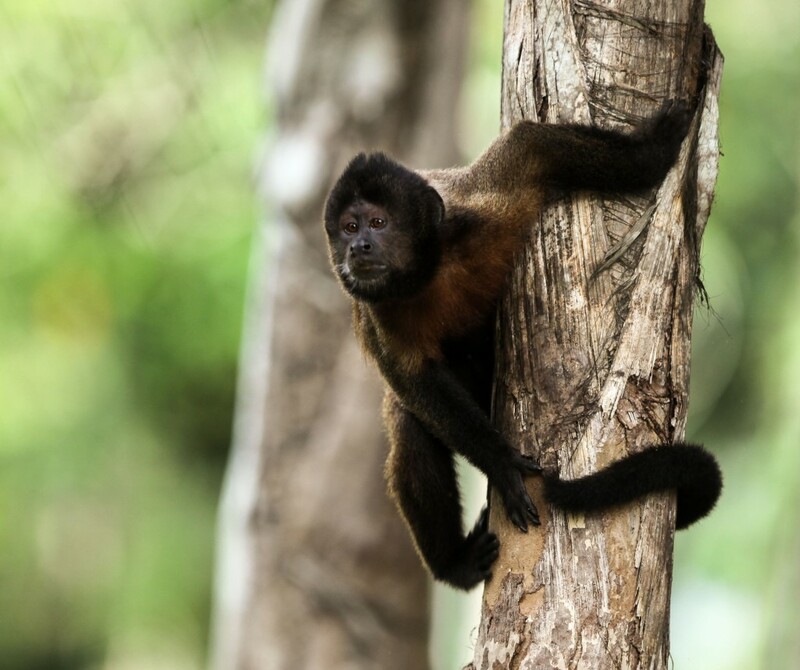 Leoncio told us that muriquis were, indeed, pretty easy to see, as were Black-horned Capuchins (Cebus nigritus) and Brown Howlers. 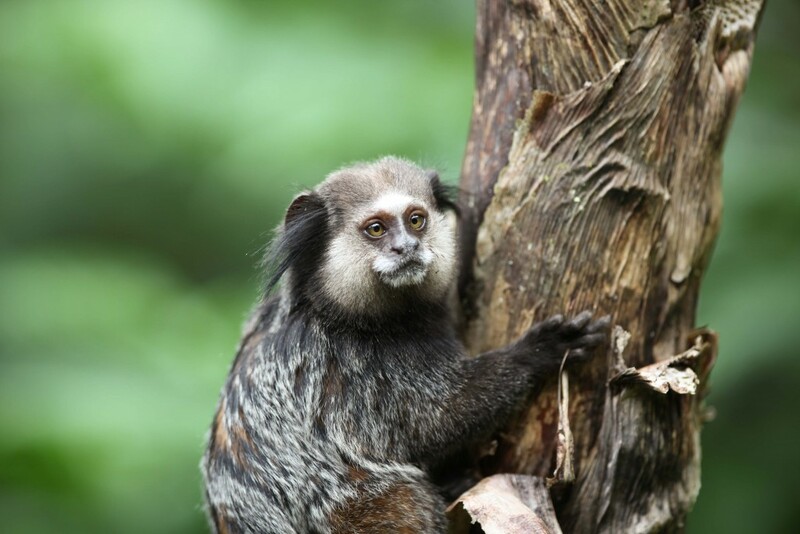 Black-fronted Titis (C. nigrifons) were also around but more often heard than seen, while the Buffy-tufted Marmoset (the species I had missed at Nazareth Paulista) were present but scarce and very rarely seen. Meanwhile Collared Peccary, Azara’s Agouti and Grey Brocket Deerwere all very easy to spot from the blinds. White-lipped Peccary were not uncommon but might take a couple of days to find. Other uncommon mammals present included Grison, Tayra, Puma and Jaguarundi. I set some small mammal traps and we took a brief and unproductive night drive. That night the cook demonstrated her talents extended beyond Lemon Meringue Pie to include mammal watching. She‘d spotted a White-eared Opossum behind the kitchen (a lifer for me). Leoncais decided to catch the animal in a cardboard box and stick it in a more photogenic tree. The opoossum was not terribly impressed by the plan. The next day we were in the forest at 7 a.m. and – after something like 150 trap nights – I caught the first animal of the trip (also to be the last). The mouse had lost the end of its tail, which made identification tricky, but despite sending it to some experts we couldn’t ID it. It was potentially quite rare. Regina and I spent five hours driving and stopping and walking and driving, up and down the trails and tracks. No muriquis and no marmosets. 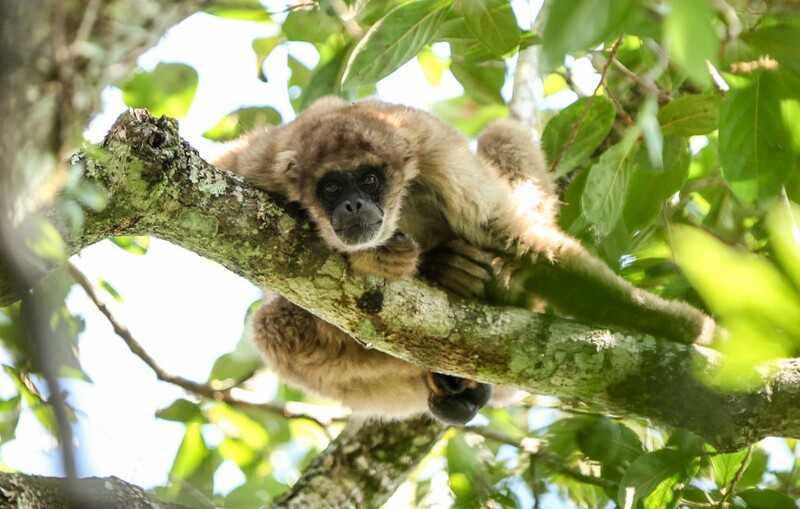 We did hear titis, and see at least three groups of capuchins, and two groups of H=howlers (the latter easily seen at the forest edge near the gate and also while scanning the forest from a rise in the road nearer to the farm). It was a fairly cold and windy day, which didn’t help us in our search, but still Leoncio couldn’t believe we’d missed the muriquis so he came back with us at 3 p.m. to help us look. Leoncio and I took a walking trail near the start of the track and left Regina to drive up and down the road. At 3 p.m. a black Jaguarundi bounded across the trail about 15 metres in front of me. 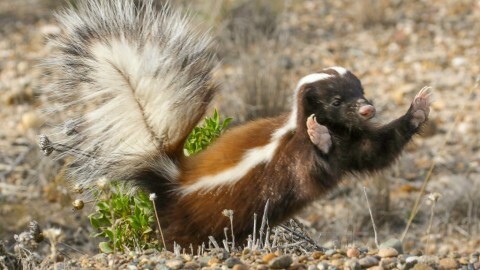 A lifer for me and one of my most wanted South American mammals. My excitement was diminshed a little back at the car when Regina broken the news that she’d seen a Tayra cross the road somewhere between the first and second feeding stations. As Regina knows well, a Tayra was another animal on my most wanted list (though luckily a bit lower down than a Jaguarundi). It’s an impressive reserve where you can see both animals in the same afternoon. But sill no muriquis. Leoncio had seen Hoary Foxes quite often around his farm so we decided to try for those before dinner, spotlighting from the back of a ute that Leoncio had kitted out with seats. But the only mammal during a cold 90 minutes was a Crab-eating Fox. If it had been warmer I suspect we might well have been lucky. 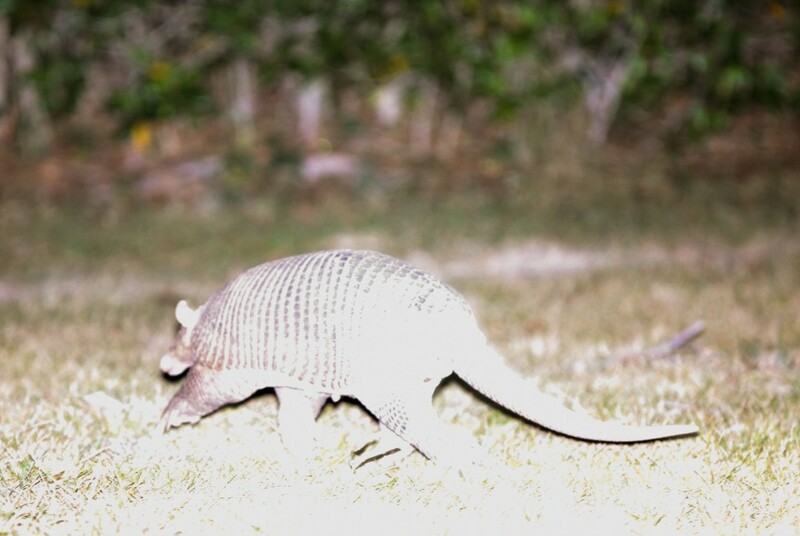 There was also plenty of evidence of armadillos: Leoncio had seen the impressive Greater Naked-tailed Armadillos (Cabassous tatouay) a couple of times in the forest too, though Yellow Armadillos were much more commonly seen. 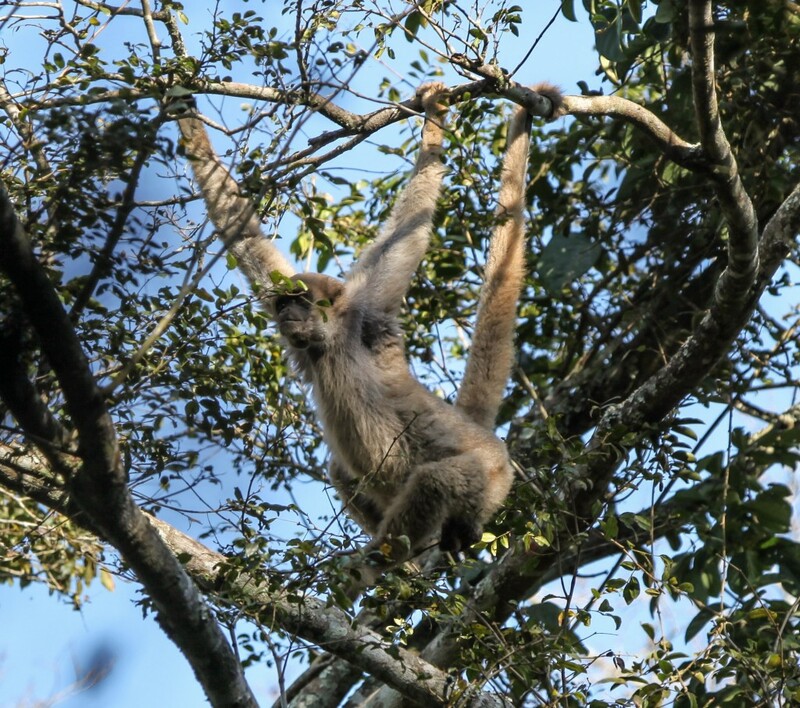 We had a final morning in Bacury before having to return to Sao Paolo, so Leoncio sent us back into the forest on the back of his ute thinking it would be easier to find the muriquis that way. Sure enough at 7.15 a.m Regina heard a crashing noise near the first feeding station and 10 minutes late I was looking at one of the world’s last 1500 Southern Muriquis. We could see only one, but could hear others nearby. The animals didn’t appear to be moving so we continued along the road to look for marmosets and Tayra, seeing neither. We got back to the muriquis at about 9 a.m. just as they were beginning to move. 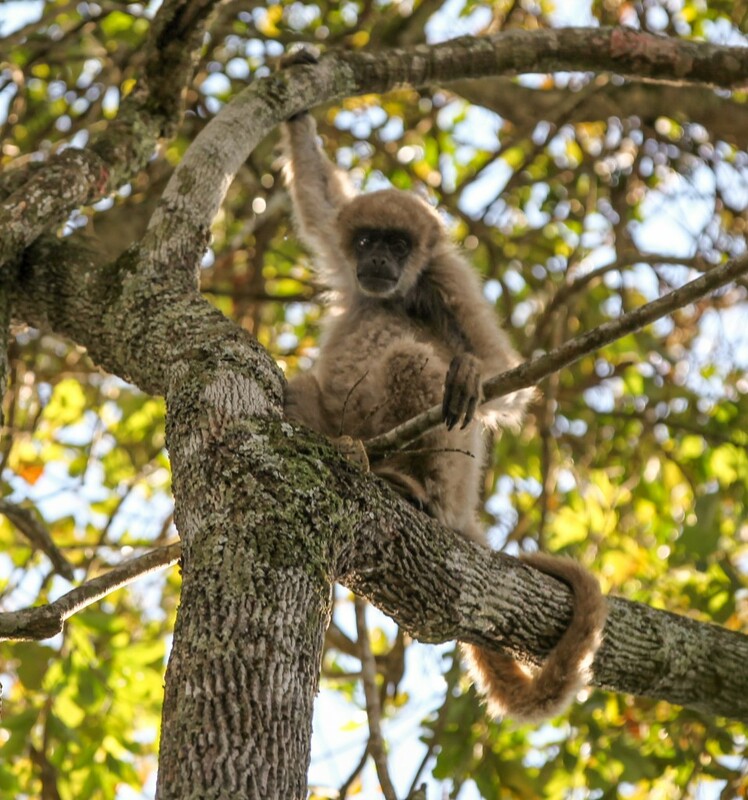 Some 10 – 15 animals gave great views as they swung through the canopy across the road. Another hour or so in the forest didn’t produce any marmosets so we headed back to Sao Paulo, getting to Guarulhos airport in about 3.5 hours. I said goodbye to Regina and a few hours later was on my way to Campo Grande, capital of the South Pantanal. The hotel Vale Verde in Campo Grande has few redeeming features other than its proximity to the airport. I left at 7 a.m. for the five hour drive to Baia das Pedras. The first two hours or so is on asphalt, the last three along a network of farm tracks that are mainly soft sand and which would be complicated to navigate on your own. It is a pretty drive and there were a few mammals along the way include several Pampas Deer, many Capybaras and a few Coatis, plus a squashed Tayra on the road not long after the start of the dirt road. 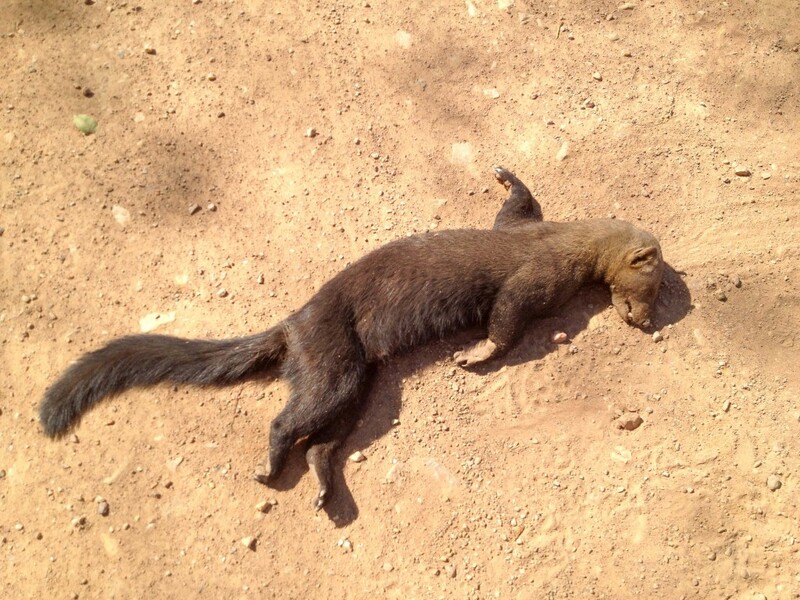 My driver said he saw Tayra quite often along the road. At the first of many good lunches at the lodge I chatted with Arnaud Desbiez who set up and runs the Giant Armadillo project here, which of course was my reason for visiting the lodge (in fact my main reason for returning to Brazil). 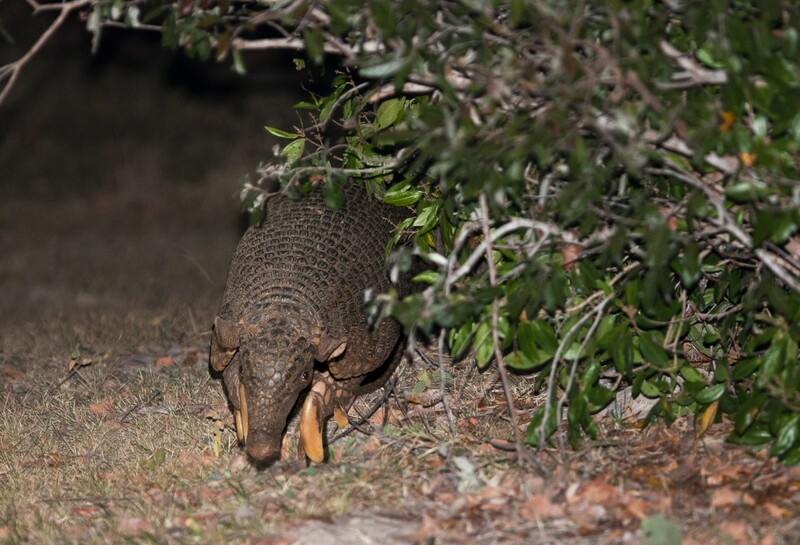 The project is the first attempt to study this cryptic and charismatic mega mammal and Arnaud explained that for him the chance to work on Giant Armadillos is a dream come true. His passion for the species, its conservation and sharing the team’s work with others was very obvious and it was hard to imagine a better or more enthusiastic champion for the animal. To learn more about their work visit their website giantarmadillo.org.br. But my moderately high hopes of seeing an animal were dampened quickly. 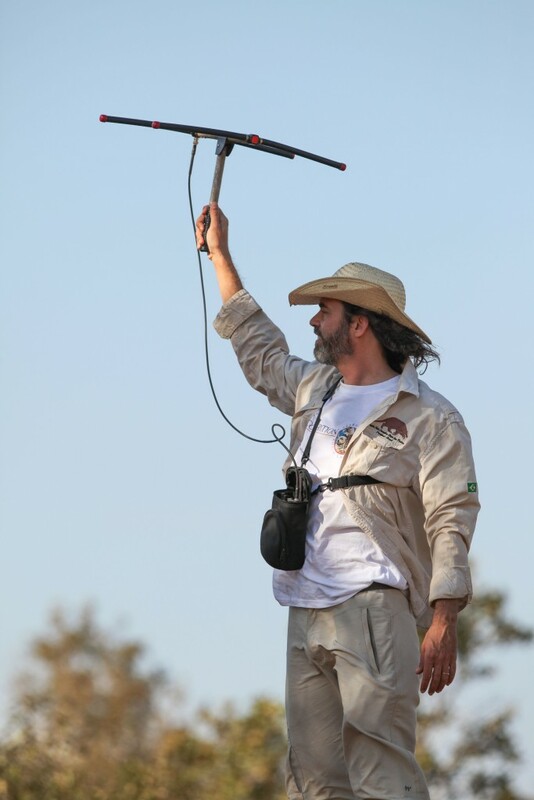 Several months earlier the project had had four animals with radio transmitters attached. But now they had only one: trying to attach a radio transmitter to an armadillo is like trying to glue an Ipod to a bulldozer. They’d been trying unsuccessfully for two months to capture more animals. 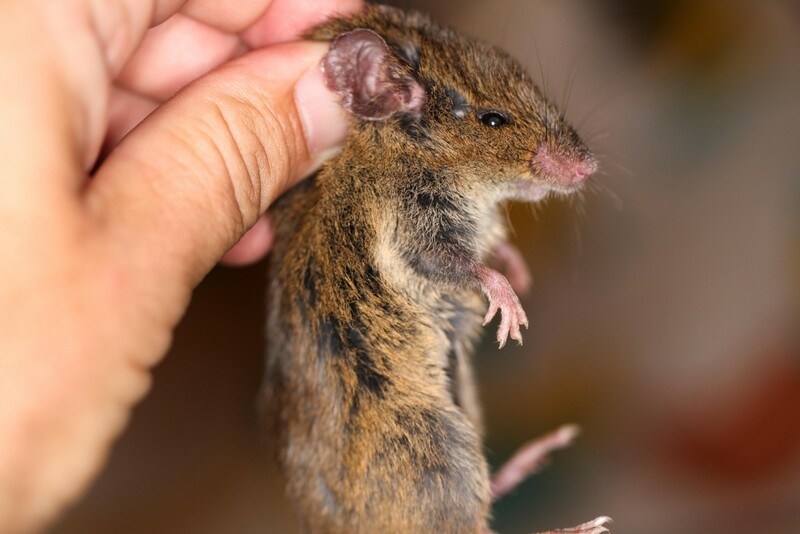 Moreover the only animal with a transmitter – a female called Isabelle – had a six week old baby and they team were trying to keep a distance from her. But Arnaud promised to see what he could think of. Meanwhile he told me that I was pretty much guaranteed of seeing the secretive Southern Naked-tailed Armadillo, as two were tagged and were giving good views in the day time. 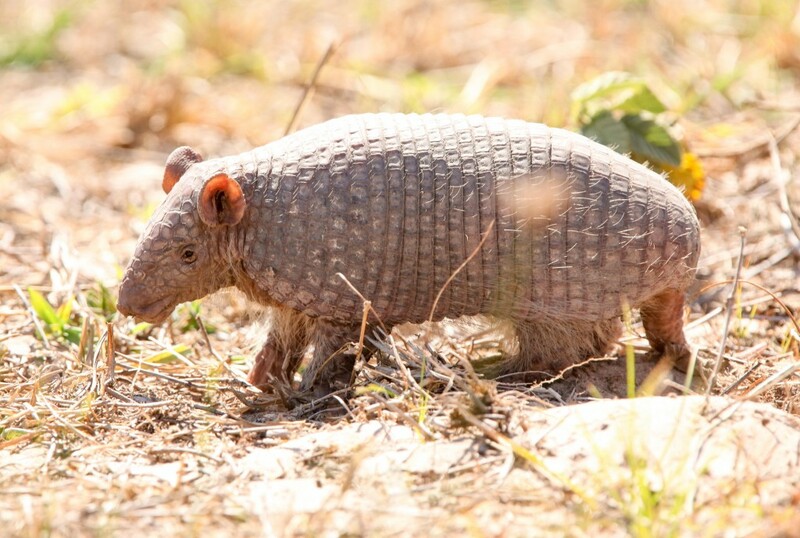 Yellow – or Six-banded – Armadillos, another diurnal species, were easy to see on the farm. 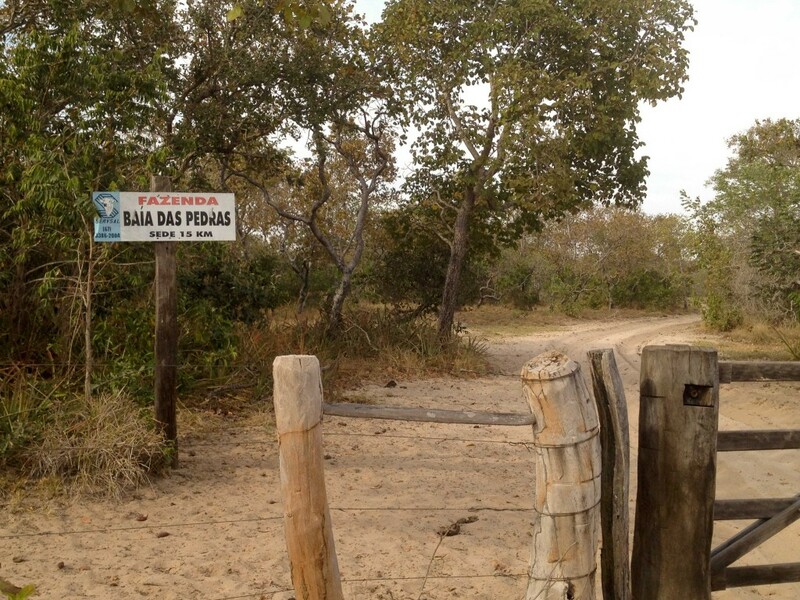 Baia das Pedras is a small lodge and a working cattle ranch. The accommodation and food are excellent. The lodge has a nice atmosphere and this part of the Pantanal is also really very pretty. Armadillos aside the mammal watching is good, with several species that are uncommon in the north easier to see here. The lodge offer various activities including Landrover and horseback safaris. Drives and activities are shared with other tourists, though the research team were also more than happy to let me go along with them for whatever they were working on, which I ended up doing most of the time. But on the first day I took an orientation afternoon drive with the other newly arrived guests for a couple of hours. 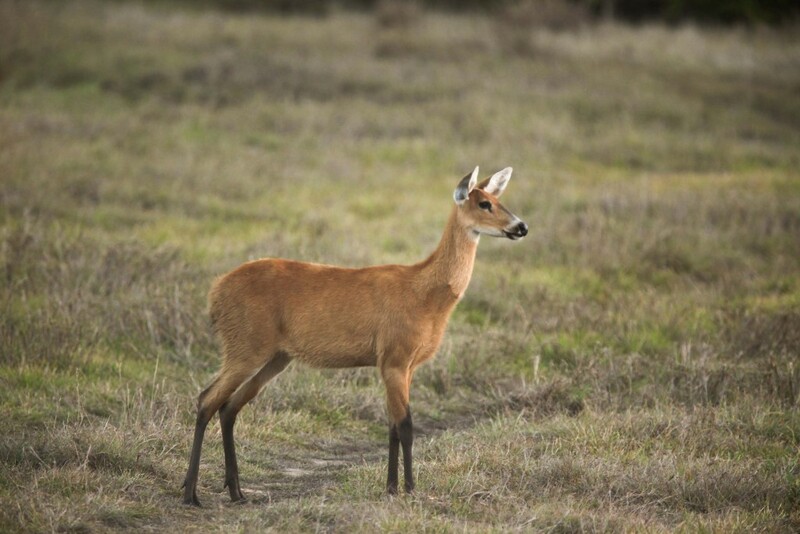 I added a Marsh Deer to the trip list and saw plenty of Pampas Deer, Capybara, Feral Pigs and Coatis. Arnaud gave a talk about the armadillo project after dinner and had some impressive pictures from camera traps of the study animals, as well as some cool pictures of the multitude of other species that use the armadillo burrows for shelter or food. 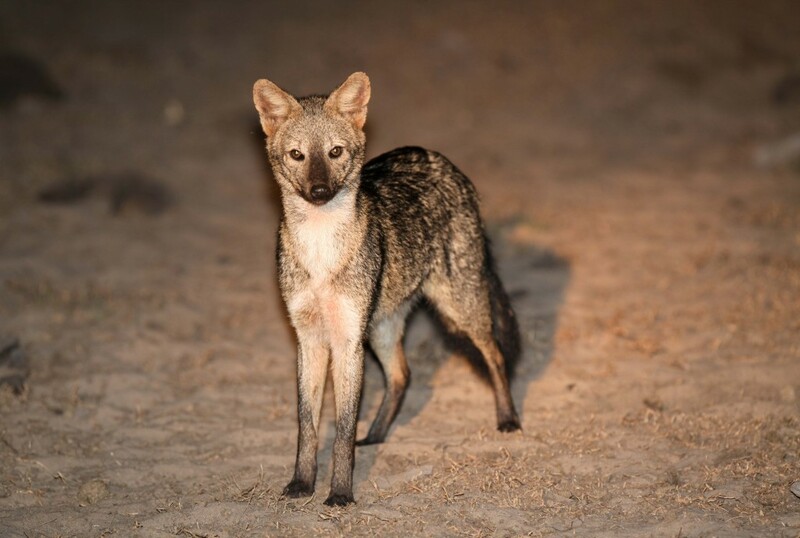 These included Peccaries, Pumas, Ocelots, Tayra and – most exciting of all – a Bush Dog! All photographed on the ranch using camera traps and proof of the important role Giant Armadillos play in this ecosystem. I also chatted with a fellow Aussie guest, Ken Trigg, who had just arrived on holiday in Brazil and who showed me a picture of what appeared to be a Pampas Cat he’d taken the previous afternoon at a place called Fazenda 23, a couple of hours from Campo Grande. They weren’t doing any Giant Armadillo monitoring after dinner but I did go out with the team at 10 p.m. to take a radio bearing on a tagged Nine-banded Armadillo. En route we saw a Crab-eating Fox and my only Crab-eating Raccoon of the trip. The next morning I saw an Azara’s Agouti just after breakfast and spent the rest of the morning staking out a Southern Naked-tailed Armadillo burrow. 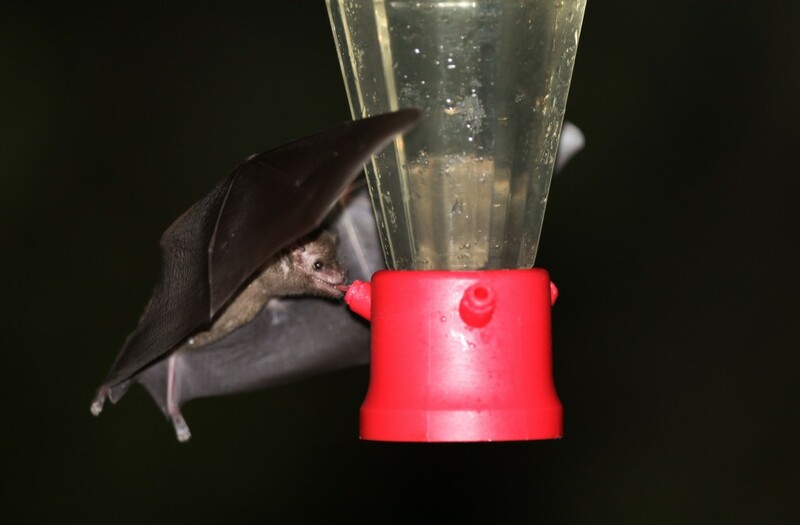 Gabriel Massocato and Ben Vecchio, who are working on the project with Arnaud, are studying this species and were generous to take me along with them several times. 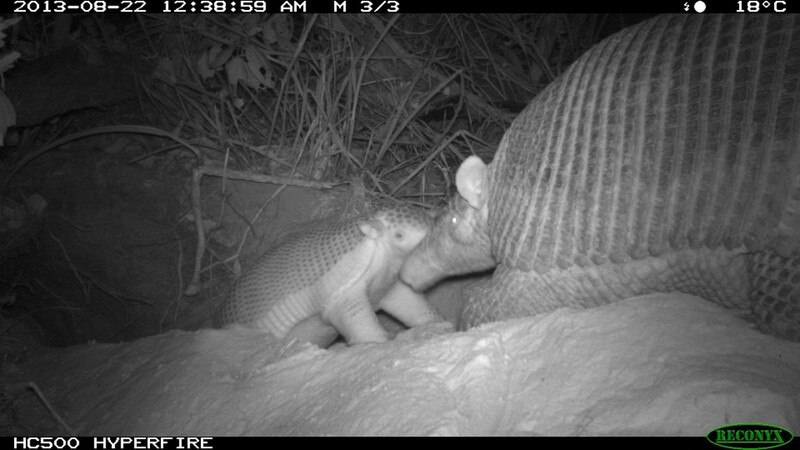 They explained that the Southern Naked-tail Armadillos could stay underground for days but at the moment the two tagged animals were typically foraging above the surface for 15 minutes every 2 hours or so from about 10 a.m. to 3pm. The species is fossorial and seems to leave its burrow only to find a new food source at which point it digs a new tunnel and goes back under. But very little is known about the animal and the research is breaking new ground. One emerged at around 10 a.m. and the other, the one I was staking out, came out at a little after 11 a.m. My camera battery died as the animal emerged, but I was able to return the next morning to get some pictures. 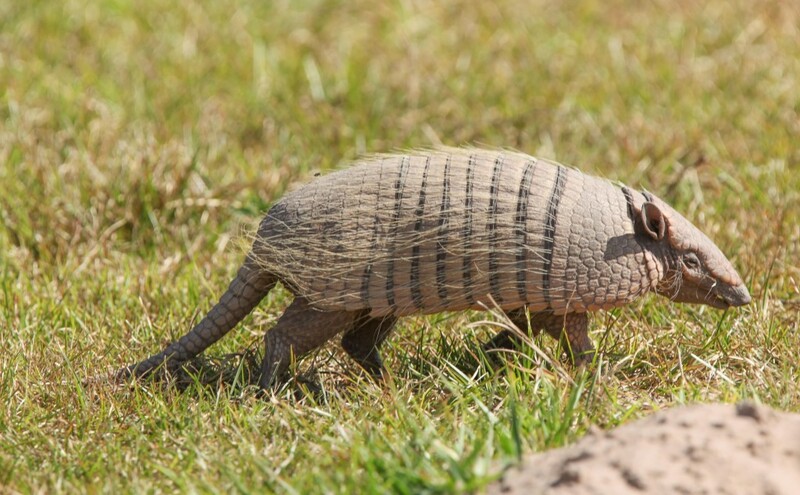 The best area for this species and Yellow (Six-banded) Armadillos is a fairly degraded patch of open land a few hundred metres south east of the lodge that is riddled with burrows. The armadillos tend to burrow in the little hummocks called “murundus” that are often islands of woodier vegetation in the flood plain (though in this particular area they had been largely cleared). Later in the day Ben spotted my first Six-banded Armadillo here. Two new armadillo species in a day. Would I get the third? 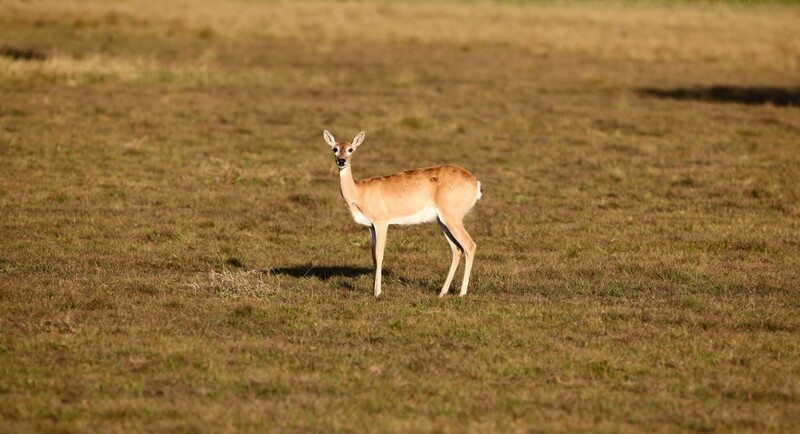 I took the 4 p.m. game drive with the lodge which was surprisingly good. 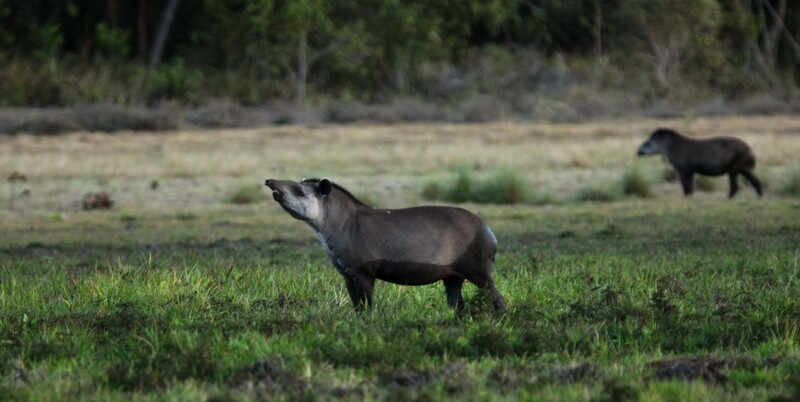 Two Tapirs out in the open were remarkably tolerant of being approached on foot. And I added Giant Anteater, White-lipped Peccaries (a sounder of 20 or so out in a baia at dusk) and Red Brocket Deer to the trip list. 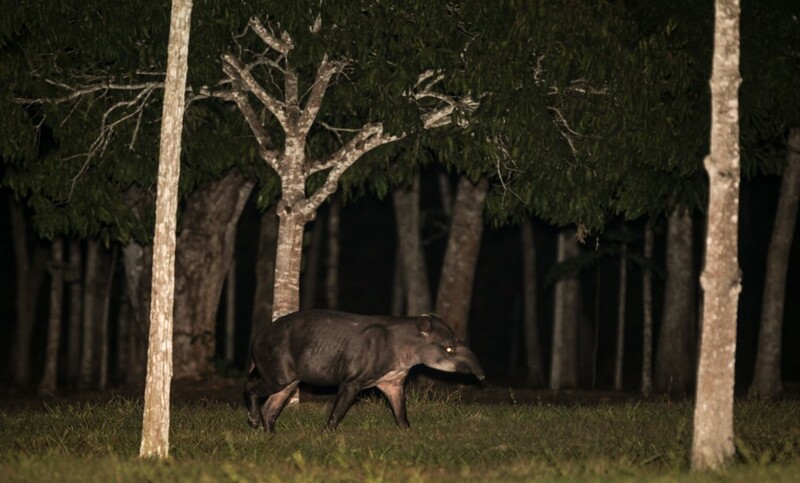 Arnaud explained that the Peccaries, Tapirs, Pampas Deer and other tasty mammals are common in this part of the Pantanal because the locals hunt the feral pigs instead. Not only does this hunting mean the native species are protected it also keeps the pig population under control (largely through splitting piglets from their mothers). A rare example of an introduced species coupled with hunting helping the native fauna. 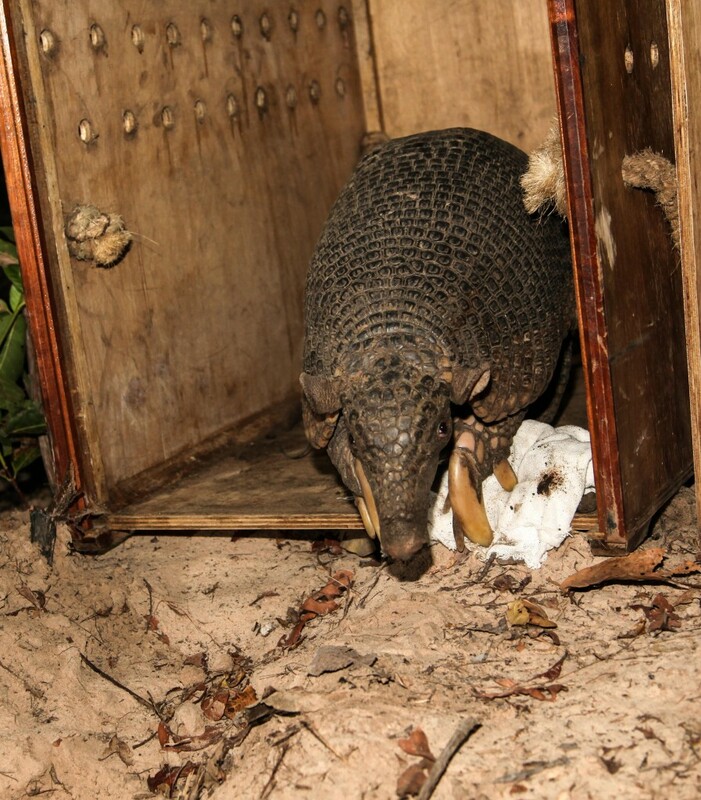 Though Arnaud was no longer working closely with Isabelle, his only tagged Giant Armadillo, he’d spent time that day locating her burrow so we could look for her in the evening. We set off just before 9 p.m. under a full moon. Isabelle’s burrow was quite deep in the forest, but the good news was her six week old baby was nearby. Isabelle typically returned to the baby every 2 – 4 nights and Arnaud thought she might return tonight: our best strategy might be to locate Isabelle and wait between her and the burrow with the baby in the hope we might bump into her (while ensuring we stayed well away from the burrow). It took 45 minutes to get to the site, which was on Santa Cruz, a neighbouring ranch. 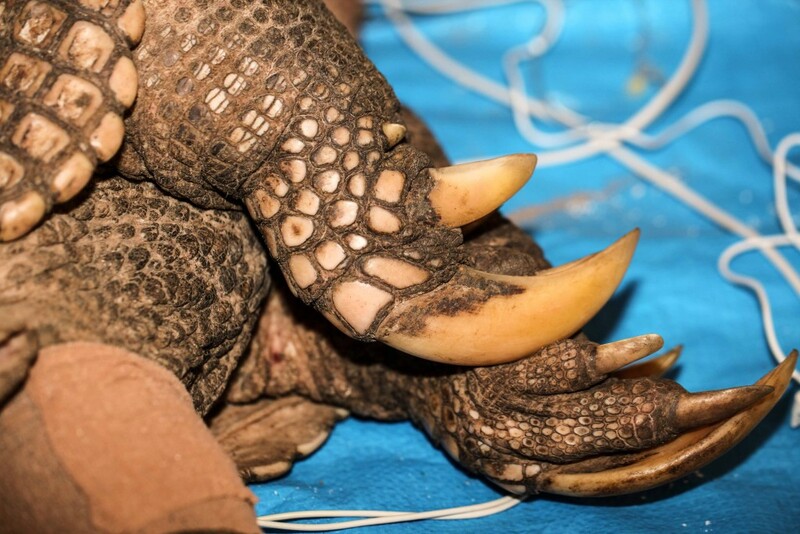 Renata Santos, another researcher who’d been working on both the Giant Armadillo and Tapir project for the past two years, was with us and eventually located a weak signal. Isabelle was already on the move. Now to find her. Arnaud wove the truck through a semi circle in the bush for a few kilometres until we located the signal on the other side of us. Again it was faint but she appeared – as predicted – to be heading towards her baby, and towards us. And we were in an open area which, if all went to plan, Isabelle would have to cross. It was a matter of waiting and hoping. The signal strength led us to believe the animal was 800 metres away but after no more than 5 minutes Renata heard a crashing noise and it was obvious that Isabelle was very close. We ran to the edge of the forest and I put my spotlight onto the back half of one of the world’s greatest mammals. Yay! And when she emerged she was coming straight towards me, only stopping and sniffing about 5 m in front of me as I started to get out of her way. I was face to face with a dinosaur. And if I’d kept still I reckon she’d have walked into me. At this point Isabelle decided something was amiss and she trotted off rapidly back into the forest. What an animal. What an experience. During all the excitement my flash partially disconnected itself from the camera and so the photos – which could have been so wonderful – were dreadful. But I won’t complain. Giant Armadillo, Priodontes maximus. Photo fail. One of many wasted photos. The team, Igor (a French visitor and now newly-converted mammal watcher) and I were all on cloud nine. Renata said it was the best sighting she’d had in two years on the project. Back at camp we toasted our success and tried to slow the adrenalin with a beer. As I did the math I realised that Isabelle was my 1300th species. On the way back the only mammal of note was a Crab Eating Fox. I owe a huge debt of gratitude to Arnaud and his team. They get a real kick from showing this mega-mammal to enthusiasts and they understand it’s an important part of their job to raise the species’ profile and help conserve it. Arnaud wanted though to be sure that anyone visiting is well aware that sightings are far from guaranteed. He estimated he’d had a better than 50% success rate of showing people a Giant Armadillo over the course of a three or four day visit, but they often failed. On one occasion a photographer worked with him for 15 nights, but got only one quick look and was never able to get a picture during 15 nights of stake outs. Sightings, when they did occur, could take many hours of waiting and were almost never as good as we’d enjoyed. That said, I am not aware of any better way to see this brilliant animal. In retrospect I should have emailed Arnaud direct before I arrived. He could, for instance, have started looking for Isabelle before I got there. And while planning a trip he would also be able to advise on chances of seeing animals. Isabelle’s radio tracker is fading fast and, as I write, the team are urgently trying to locate more animals. 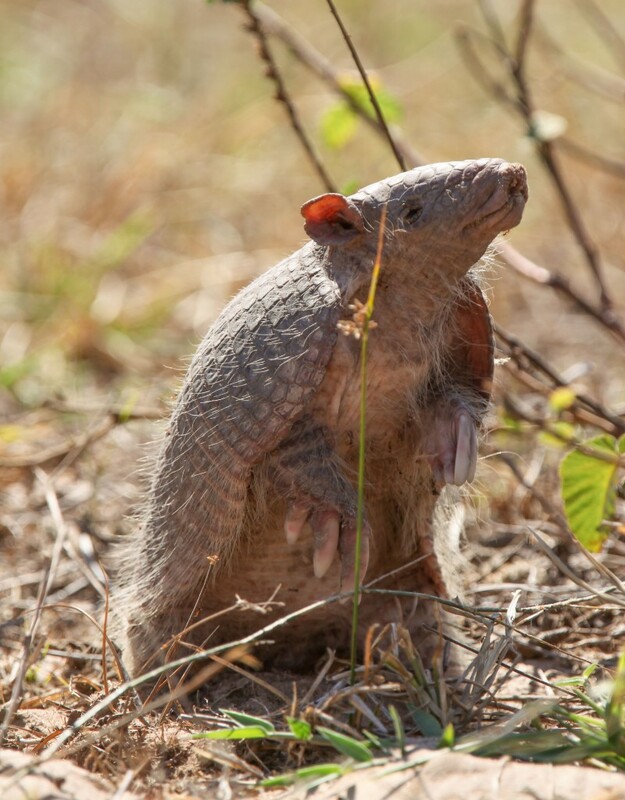 I spent the next day with Team Naked-tailed Armadillo. 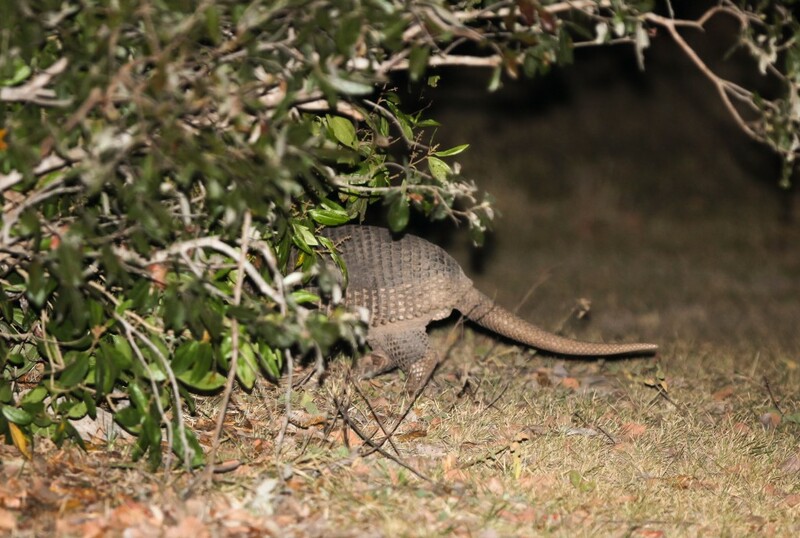 While waiting for one of the tagged Southern Naked-taileds to emerge, we spotted another Yellow Armadillo and then what we eventually realised was an untagged Southern Naked-tailed. Gabriel caught it and took her back to the lab for health tests. 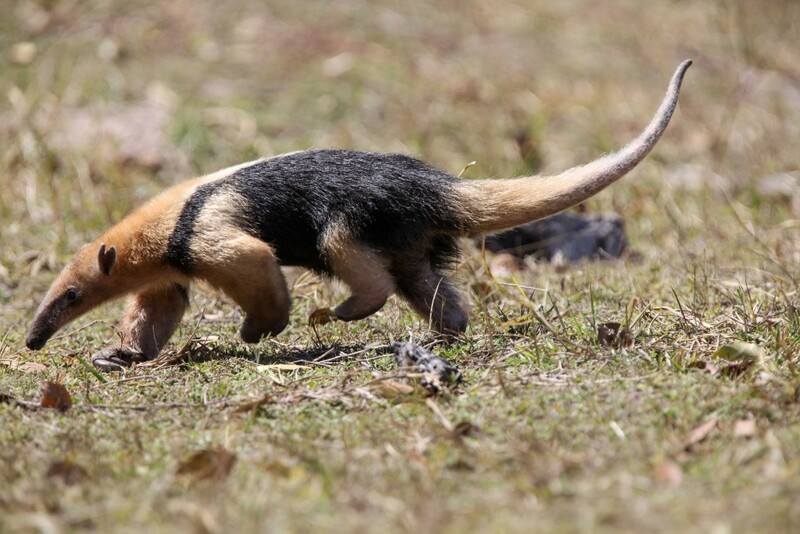 A Tamandua wandered by at 11 a.m. 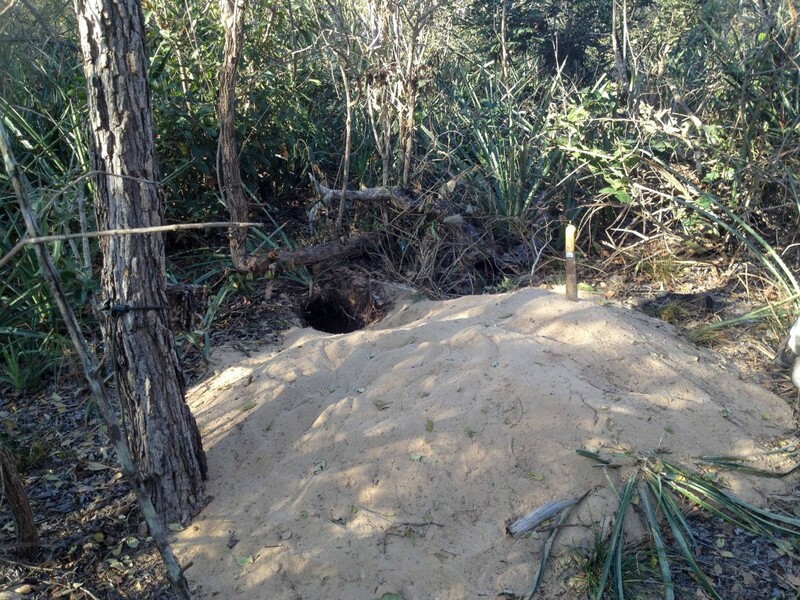 In the morning Arnaud’s team had found fresh Giant Armadillo digging about 6 km from the lodge. Flushed with the miraculous success of the night before he decided it might be worth visiting the area on the extreme off-chance that we could see another animal and capture it. As we were spotlighting our way to the area I heard the radio crackle and a second later was clinging for dear life to the back of the ute as Arnaud took off like a bat out of hell. Five minutes later the excitement was clear. The vehicle in front of us had seen and caught another Giant Armadillo: Dayse, an animal who had been captured earlier in the year but who’d lost her transmitter 3 days later. Arnaud was the happiest biologist in Brazil. I was the happiest mammal watcher. Back to camp for more celebratory beer. I spent my last day on the ranch watching the researchers perform various health checks on Dayse in the lab and then we visited Isobel’s new burrow in the forest as well as the other burrows she’d used for her baby (where she gave birth was marked with a construction site quantity of sand). Arnaud also retrieved some more brilliant footage of the baby from the camera trap. I’d been trying to catch small mammals during my stay and, as everywhere in Brazil, had failed dismally. 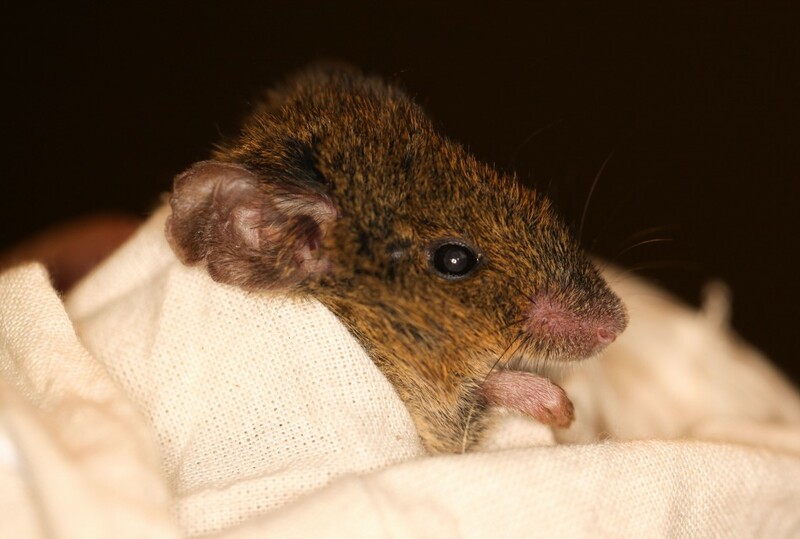 Gabriel had shown me a colony of rodent burrows out near the Naked-tailed Armadillo study site and while setting my traps after dark I saw one animal looking at me from the burrow. Twice I went to get my camera and twice it disappeared. But despite surrounding its burrow with traps I didn’t catch it the next day. I did get a good look and and will hopefully be able to work the species out one day. 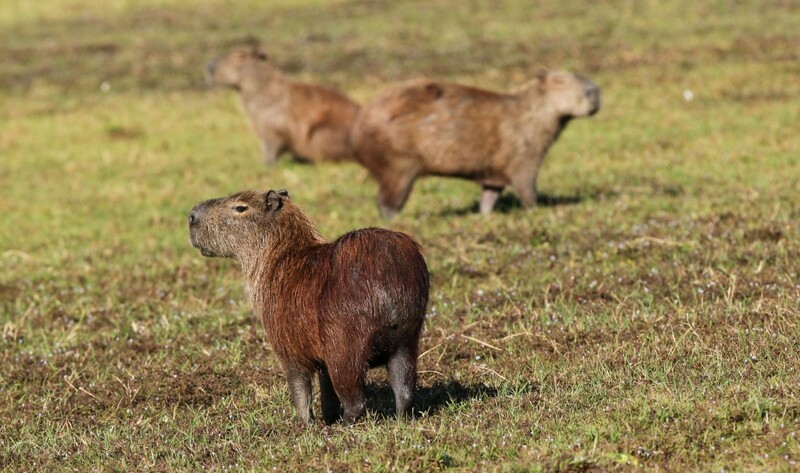 That evening I took a final night drive with Rita from the lodge that didn’t produce much other than Pigs, Pampas Deer and Capybara. I left early the next morning for the flight home. Arnaud had more great material from the camera traps, including photos of Isabelle moving her six week old baby to another burrow. Very sweet. Once again a huge obrigado to Arnaud and his brilliant team. Some of the nicest and most dedicated biologists I have ever met. I hope many others get a chance to visit and see the utterly awesome Tatu Canastra. A successful trip for me. In 17 days I saw almost 40 species, at least 15 of them lifers though I imagine I will end up with a few more if I figure out the rodents. Regina’s planning was excellent as always, as were all the people she introduced me to. Just a pity about Banco Do Bloody Brazil. Not very much really. Missing the marmosets at Nazareth Paulista was annoying but I am pretty sure if my flight hadn’t been delayed I’d have seen them on the first morning. My view of the Coastal Black-handed Titi was too short and I still wonder if I was hallucinating but other than that I saw everything I had hoped to see on my priority list, plus the Jaguarundi was a real bonus. I also got closer to a Tayra than I’d done before, but figure that is a species I will run into – or over – one day and there isn’t much point in trying especially to see one as they are unpredictable. Regina’s planning was pretty much spot on. I could have skipped a day at Serra Bonita but other than that think I had the right amount of time everywhere. August is a good time to visit too. 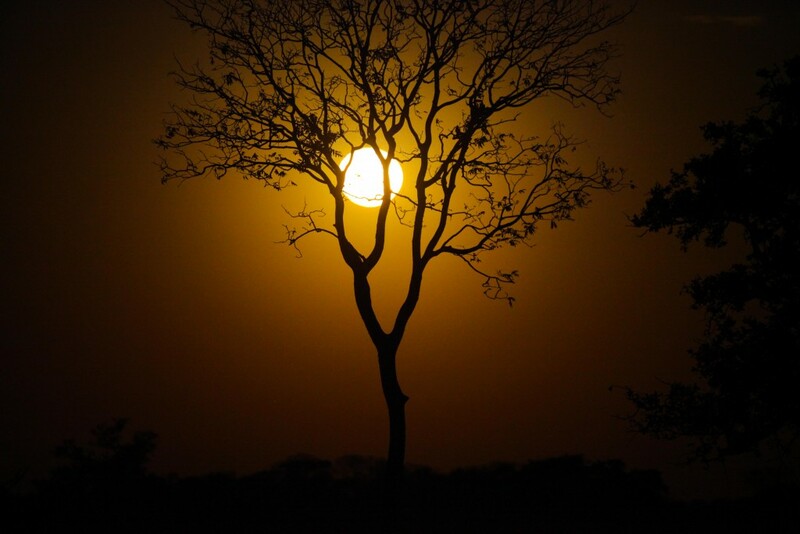 The weather was pleasant in most places but already quite hot in the Pantanal. For once I didn’t hear people telling me “Oh you really ought to come back in <pick a month>, they are easy to see then”.